02. 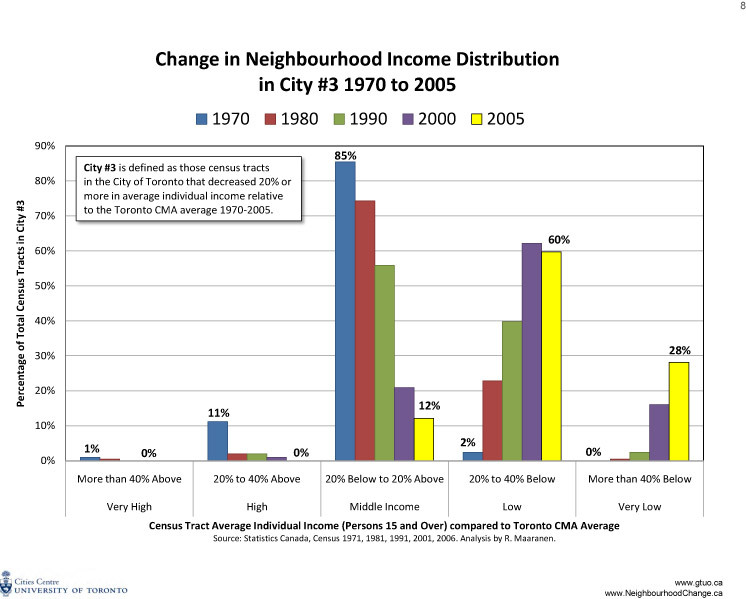 How and why do neighbourhoods change? 04. 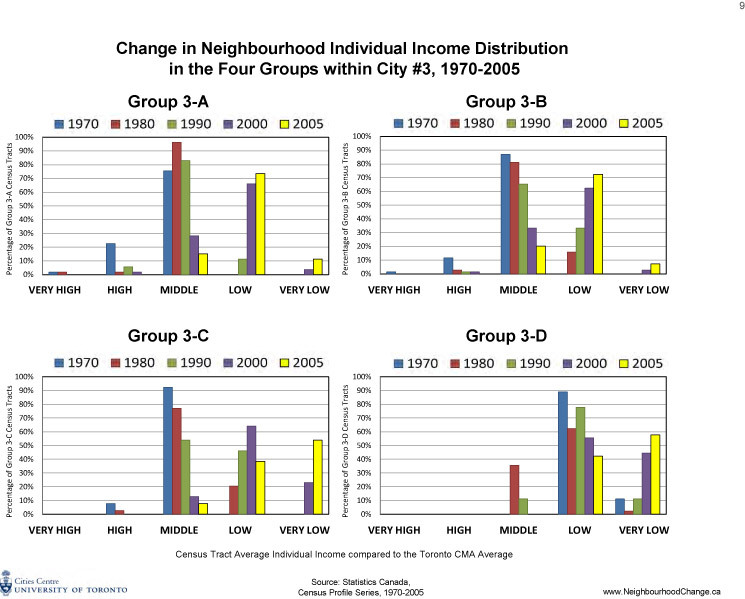 How have the three groups of neighbourhoods changed? 05. 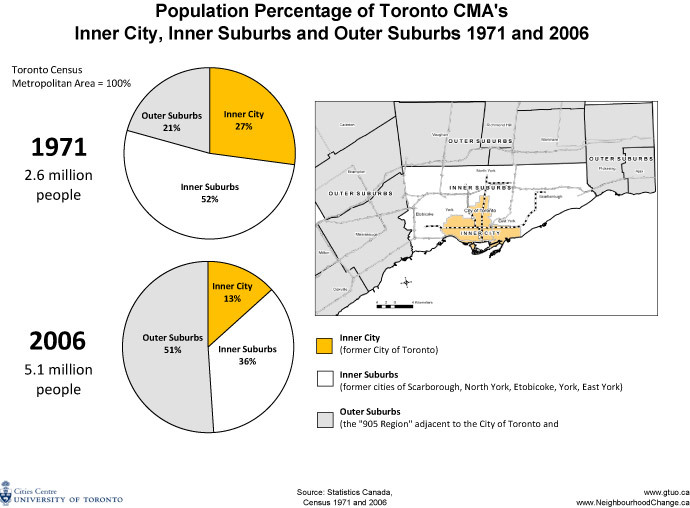 Did Toronto’s middle-income people move to the outer suburbs? 07. A blip or a trend? 08. What has changed between 2001 and 2006? The research team acknowledges with thanks the financial support of the Social Sciences and Humanities Research Council of Canada. The research team: Larry S. Bourne, Philippa Campsie, Deborah Cowen, Rick Eagan, Maureen Fair, Paul Hess, J. David Hulchanski, David Ley, Richard Maaranen, Robert A. Murdie, Sylvia Novac, Emily Paradis, Damaris Rose, R. Alan Walks. University of Toronto institutional support provided by: Cities Centre (and its predecessor, Centre for Urban and Community Studies), Department of Geography, Program in Planning, Faculty of Social Work, and the Faculty of Architecture, Landscape, and Design. Toronto is sometimes described as a "city of neighbourhoods." It seems an odd description, since nearly all cities contain neighbourhoods, but it is intended to imply that Toronto’s neighbourhoods are especially varied and distinctive. However, neighbourhoods are not fixed entities. Although some neighbourhoods change very little in their physical, social, and demographic composition over time, others may change significantly in the course of a few years. This report provides a new way of looking at Toronto’s neighbourhoods. It focuses on who lives where, based on the socio-economic status of the residents in each neighbourhood, and how the average status of the residents in each neighbourhood has changed over a 35-year period. 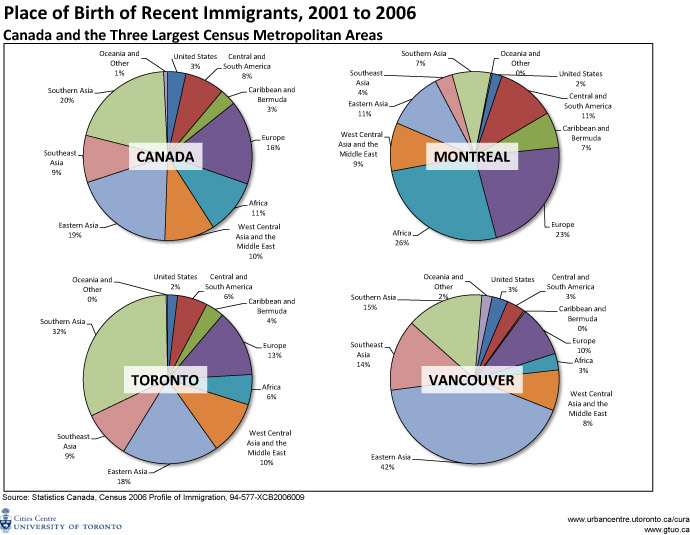 It shows that Toronto’s neighbourhoods fall into one of three categories — creating three distinct Torontos. Why is this important? Cities have always had pockets of wealth and poverty. Neighbourhoods in the great cities of the industrialized world have undergone many transitions over the course of their history. 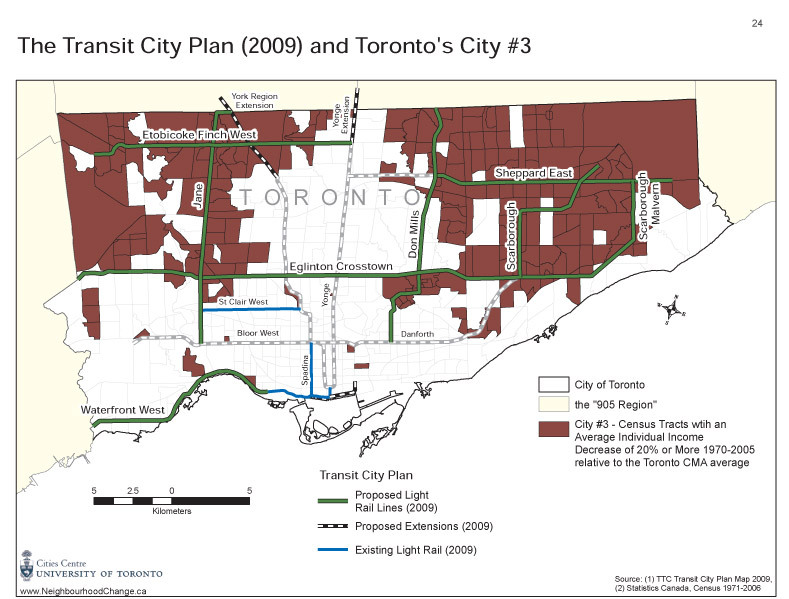 However, the City of Toronto’s neighbourhood transition has been relatively sudden and dramatic, and the changes have serious consequences for Toronto residents. 05. 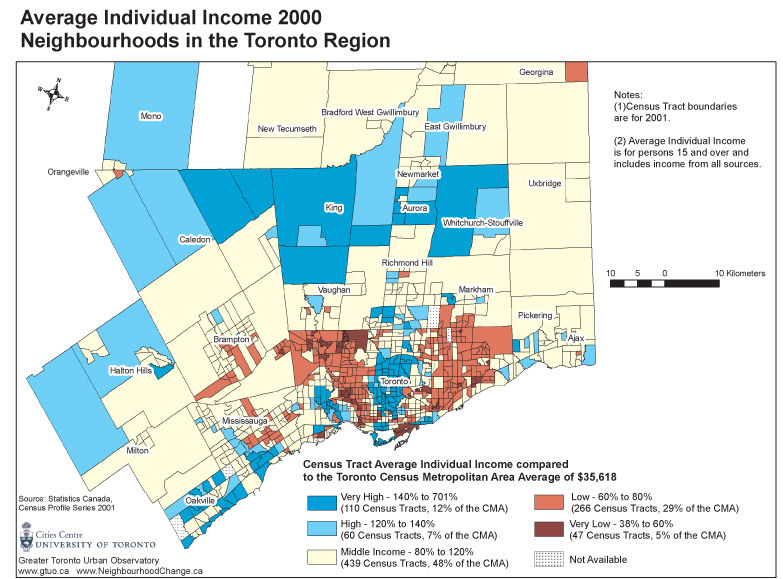 Where are Toronto’s middle-income people? Did they move to the suburbs (the “905” region)? 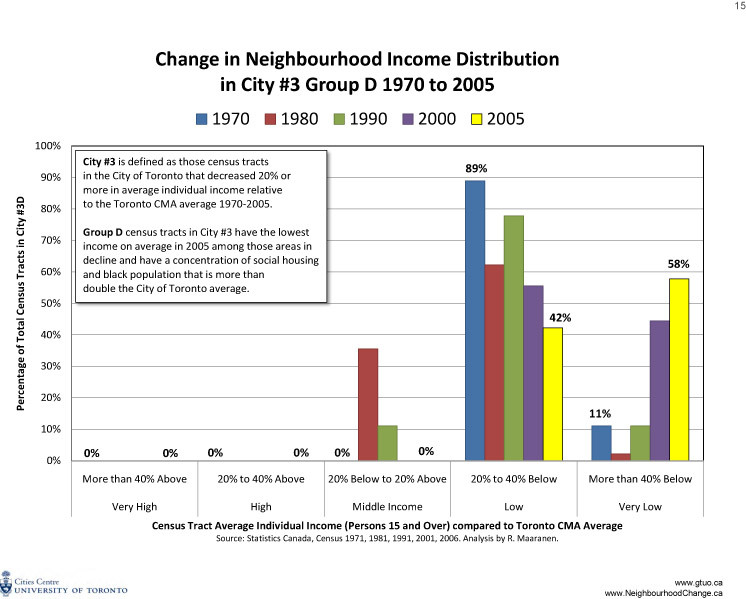 Toronto’s neighbourhoods fall into three clear groups based on income change, 1970 to 2005. 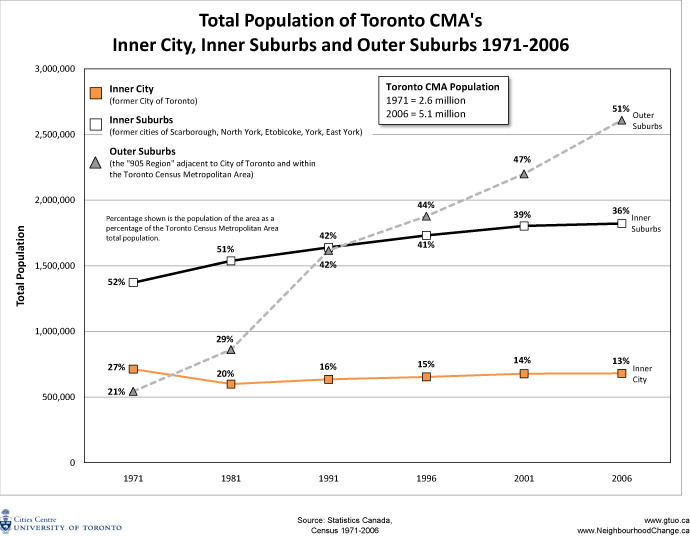 The first, which we call City #1, is a predominantly high-income area of the City of Toronto in which neighbourhood incomes have risen a great deal relative to the Toronto Census Metropolitan Area (CMA) average since 1970; these neighbourhoods are generally found in the central city and close to the city’s subway lines. 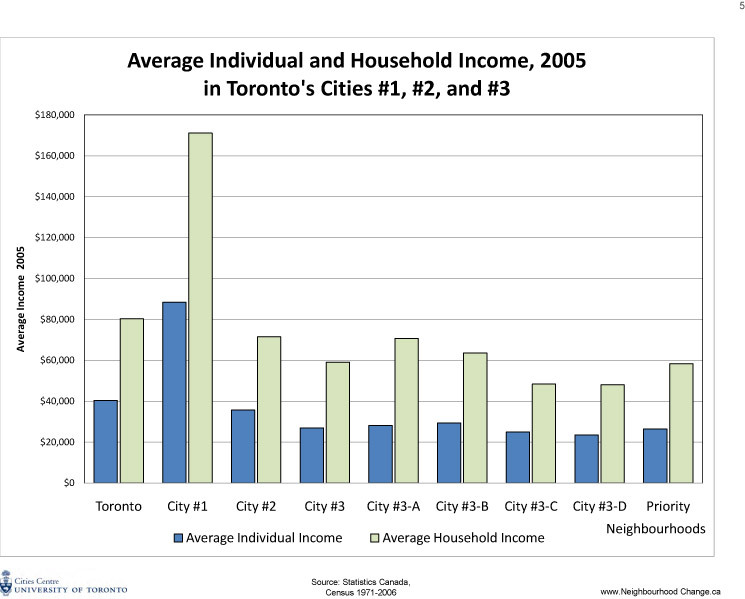 By contrast, City #3 is a generally low-income area of Toronto, in which neighbourhood incomes have fallen substantially over the past few decades compared to the CMA average; these neighbourhoods are found mostly in the northeastern and northwestern parts of Toronto. 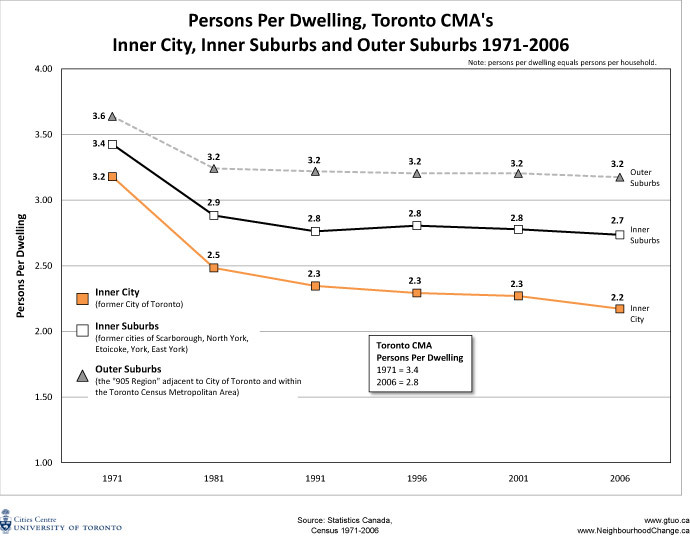 In between these two is City #2, a mainly middle-income area, where neighbourhood incomes have remained fairly close to the CMA average since 1970. While all cities can be divided into various groupings, the important finding in this research is the consistent trend over time: the three groups of neighbourhoods are changing at different rates and moving further apart. 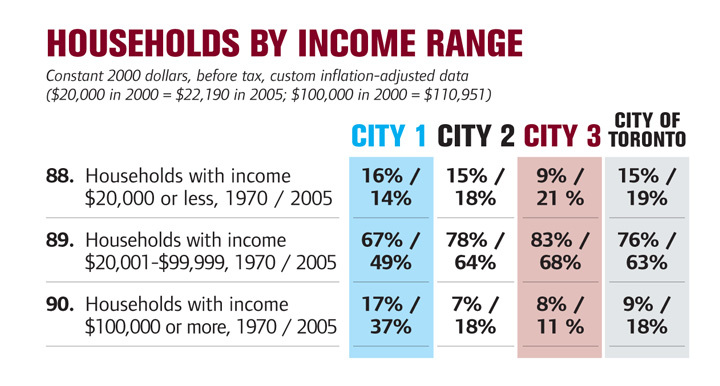 The middle-income area of the city shrank dramatically between 1970 and 2005, while the highincome area increased slightly and the low-income area increased substantially. 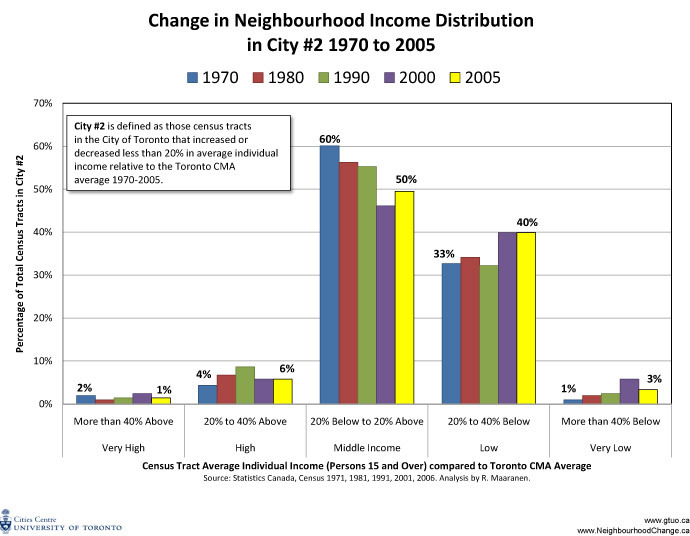 Based on comparisons of neighbourhood income with the CMA average, the proportion of middleincome neighbourhoods (incomes less than 20% above or below the CMA average in each year) was 66% in 1970, but only 29% in 2005. 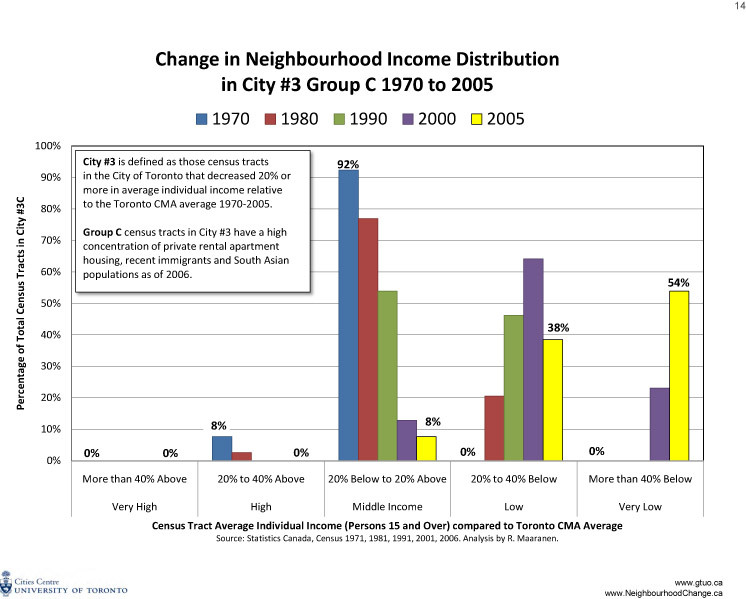 Meanwhile, over the same period, high-income neighbourhoods (neighbourhood incomes 20% or more above the CMA average) grew from 15% of the city’s neighbourhoods to 19% and low-income neighbourhoods (neighbourhood incomes 20% or more below the CMA average) grew from 19% of the city’s neighbourhoods to 53% (extremely low-income neighbourhoods grew from 1% to 9%). 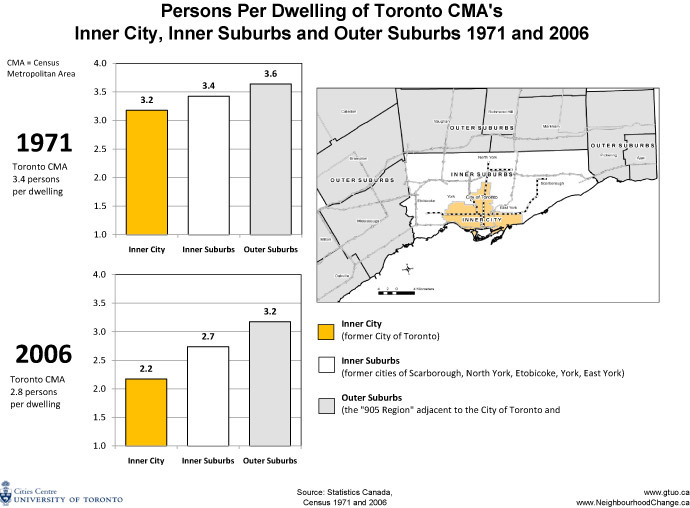 Middle-income households have not simply moved to suburban municipalities beyond Toronto, because a similar trend can be seen in the rest of the Toronto CMA. Poverty has moved from the centre to the edges of the city. 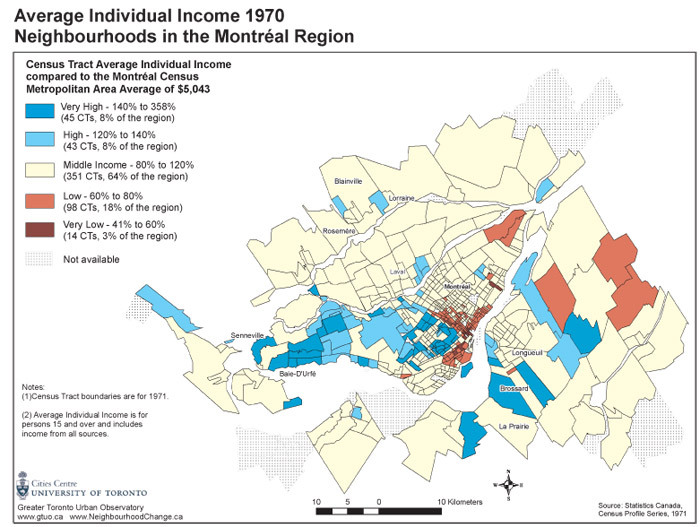 In the 1970s, most of the city’s low-income neighbourhoods were in the inner city. This meant that low-income households had good access to transit and services. Some of these neighbourhoods have gentrified and are now home to affluent households, while low-income households are concentrated in the northeastern and northwestern parts of the city (the inner suburbs), with relatively poor access to transit and services. 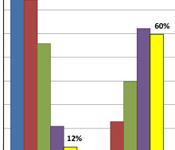 The study looked at trends for a 35-year period, and found most of the changes to be persistent. 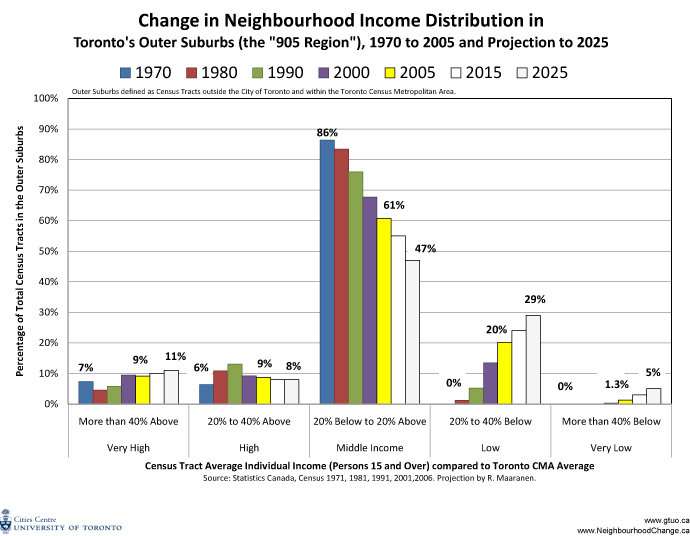 The polarization of the city into wealthy neighbourhoods and greater numbers of disadvantaged neighbourhoods is continuing and middle-income neighbourhoods are disappearing. The segregation of the city by income is not inevitable or irreversible. These trends could be slowed or reversed by public policies that would make housing more affordable to low-income households, by efforts to expand access to transit and services in neighbourhoods where the need is greatest, and by renewing the aging high-rise neighbourhoods scattered throughout City #3 (e.g., by the Tower Neighbourhood Renewal initiative: www.TowerRenewal.ca). Neighbourhood Change > The Three Cities Home > How and why do neighbourhoods change? Neighbourhoods are complex blends of physical, social, and psychological attributes. Each neighbourhood provides different access to physical infrastructure and social and community services. Each has its own history. Each is the outcome of an ongoing process of collective action involving various social, political, and economic forces, both internal and external. These processes lead to neighbourhood change. The price of housing is a key determinant of neighbourhood stability or change in societies where the real estate market largely governs access to housing. Higher-income households can always outbid lower-income households for housing quality and preferred locations. If a lower-income neighbourhood has characteristics that a higher-income group finds desirable, gentrification occurs and the original residents are displaced. The opposite also occurs. Some neighbourhoods, once popular among middle- or higher income households, fall out of favour and property values fail to keep up with other neighbourhoods. Over time, lower-income households replace middle- and higher-income households. 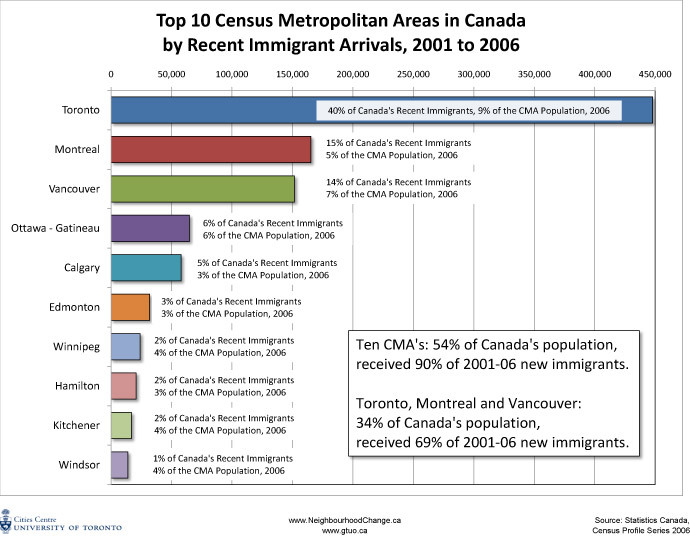 All these processes can be observed in the “city of neighbourhoods.” Rapid growth and a culturally diverse population have affected not only Toronto’s performance in national and world arenas, but also its neighbourhoods. In the 35 years between 1970 and 2005, the incomes of individuals have fluctuated, owing to changes in the economy, in the nature of employment (more part-time and temporary jobs), and in government taxes and income transfers. 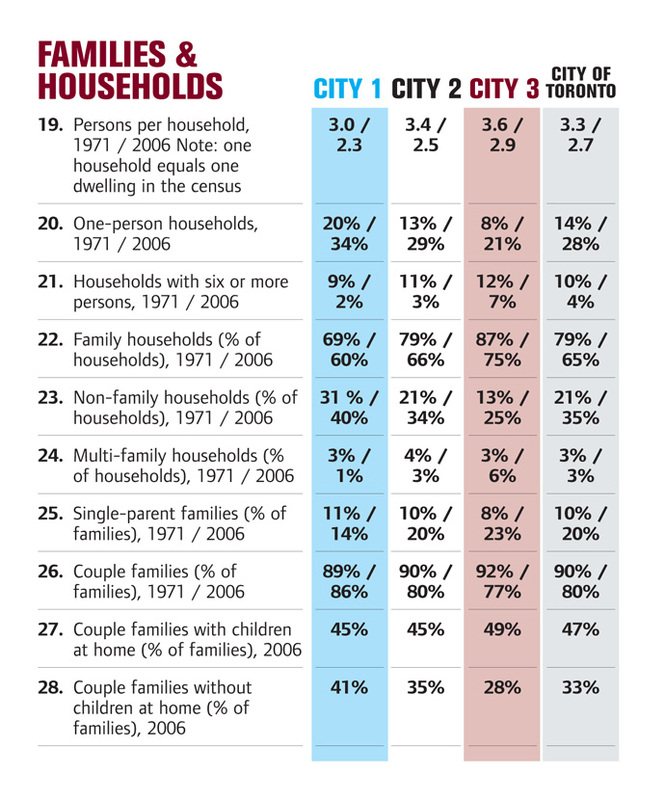 These changes have resulted in a growing gap in income and wealth and greater polarization among Toronto’s neighbourhoods. There is no one way to draw boundaries that define specific neighbourhoods. Defining a neighbourhood is, in the end, a subjective process. Neighbourhoods encompass each resident’s sense of community life. There is no doubt, however, about the importance of neighbourhoods and their effects on health, educational outcomes, and overall well-being. In this study, our definition of a “neighbourhood” differs from that of the City of Toronto, which has defined and named only 140 neighbourhoods. Each represents a group of census tracts — on average, 3.8 census tracts and about 17,900 people. The city’s definition of neighbourhoods helps define and provide names for districts within the city, but they are too large to represent the lived experience of a neighbourhood. Individual census tracts come closer to that experience, even though they are statistical artifacts and do not always capture the true notion of neighbourhood. The City of Toronto is huge: 632 square kilometres (244 square miles). With more than 2.5 million people living in its residential areas, a 20% increase since the early 1970s, the nature of its neighbourhoods has changed over time to reflect significant changes in the demographic characteristics and economic situation of their residents. Thirty-five years is an adequate period to examine the nature of change in neighbourhood characteristics and to identify trends. Many of the questions asked in the 1971 census are still used in current census forms; therefore it is possible to analyse many aspects of neighbourhood change since that time. 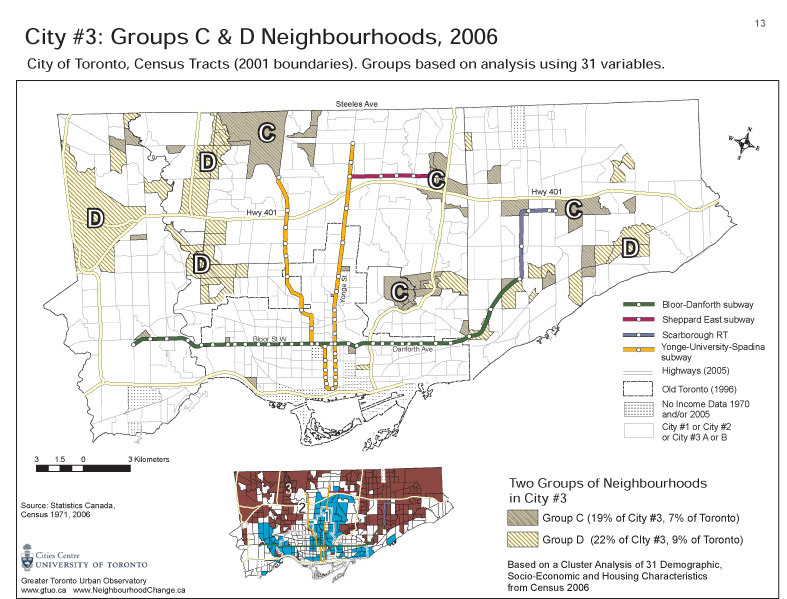 Thanks to a research grant from the Social Sciences and Humanities Research Council, a data analysis team at the University of Toronto’s Cities Centre (formerly the Centre for Urban and Community Studies) organized census data at the census-tract level for the Toronto CMA between 1971 and 2006. 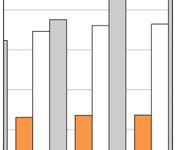 To avoid confusion with dates, note that incomes reported in the 1971 and 2006 censuses represent those of the preceding calendar years (1970 and 2005). 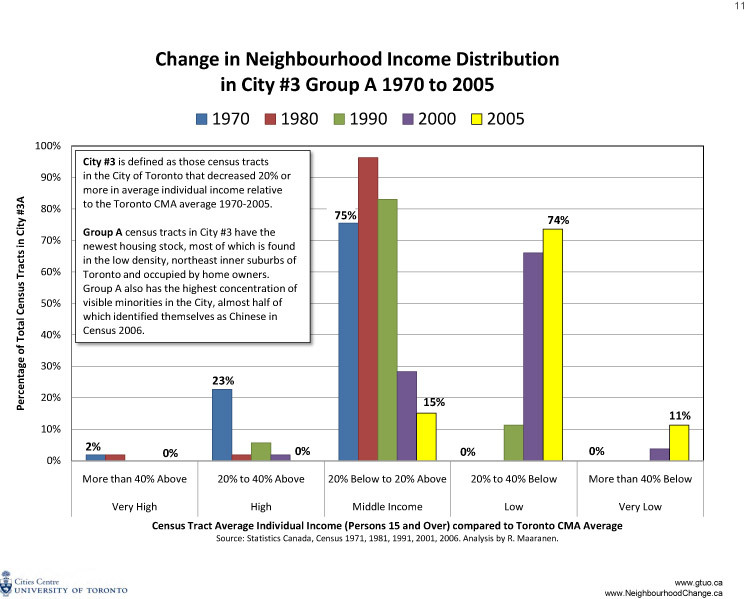 Over the course of 35 years, the pattern of who lives where in Toronto on the basis of socio-economic characteristics has changed dramatically. 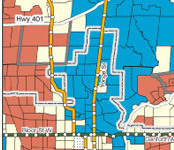 There has been a sharp consolidation of three distinct groupings of neighbourhoods in the city. No matter what important indicator of socio-economic status is used, the results are very similar. In this report we use the starting point in any study of the socio-economic status of individuals — individual income. 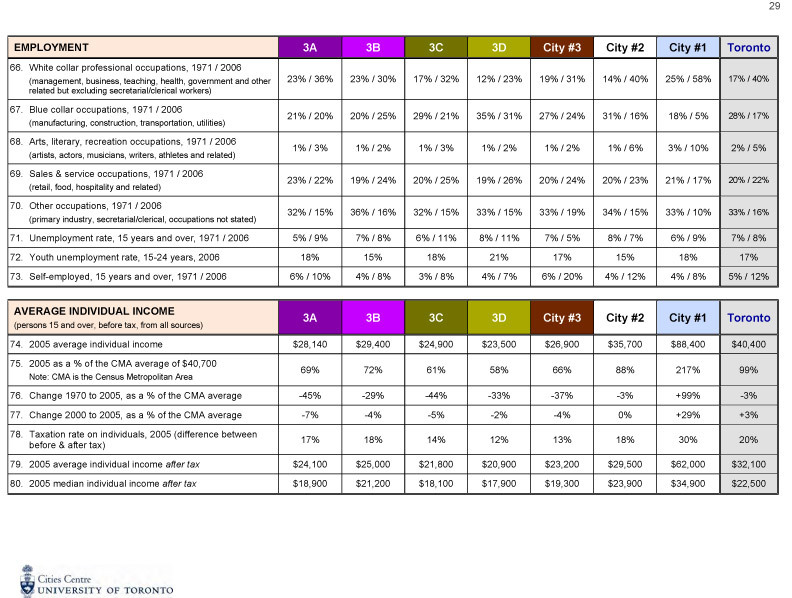 Using the 2001 census tract geography, we started by comparing the average individual income of people 15 years and older in each census tract in 1970 with the average individual income of people 15 years and older in the same census tracts in 2005 (see Map 1 and Table 1 and the note on methods at the end of this report for definitions). 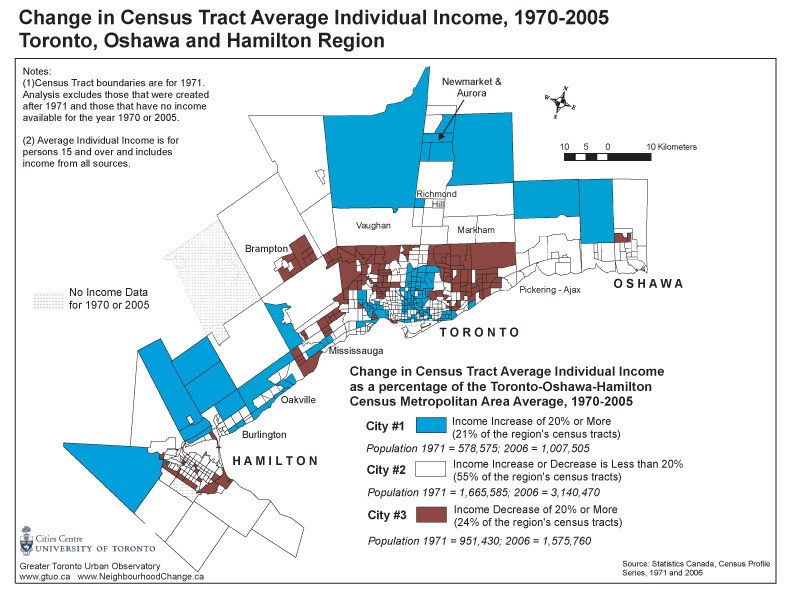 To control for inflation between the two years, we divided the average census tract income by the average income of the entire Toronto census metropolitan area (CMA) thereby obtaining a ratio for each year, 1970 and 2005. We did this for every census tract for 1970 and 2005 (as reported in the 1971 and 2006 censuses). Finally, we calculated the percentage increase or decrease in the two ratios. 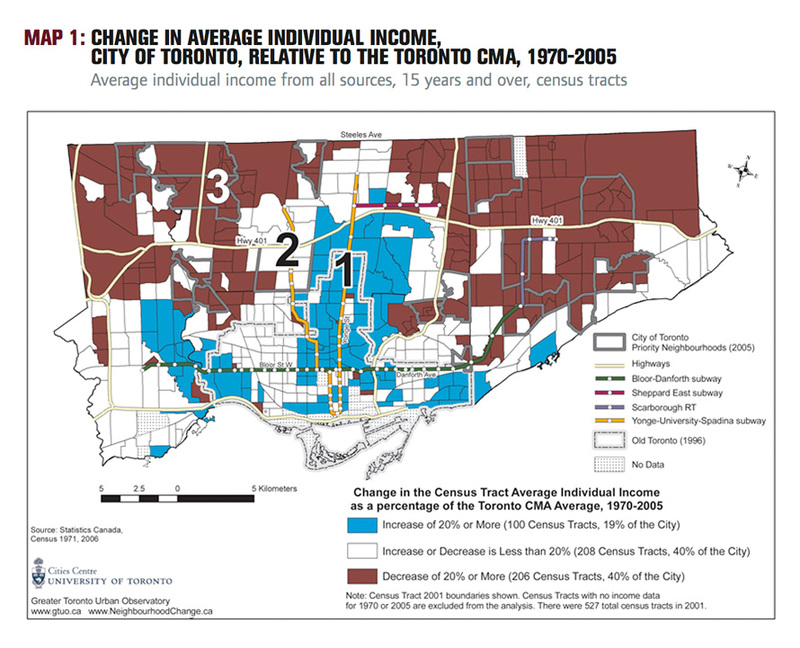 Three categories are shown in Map 1: (1) in City #1 individual incomes increased by 20% or more; (2) in City #2 incomes increased or decreased by less than 20%, and (3) in City #3 incomes decreased by 20% or more. 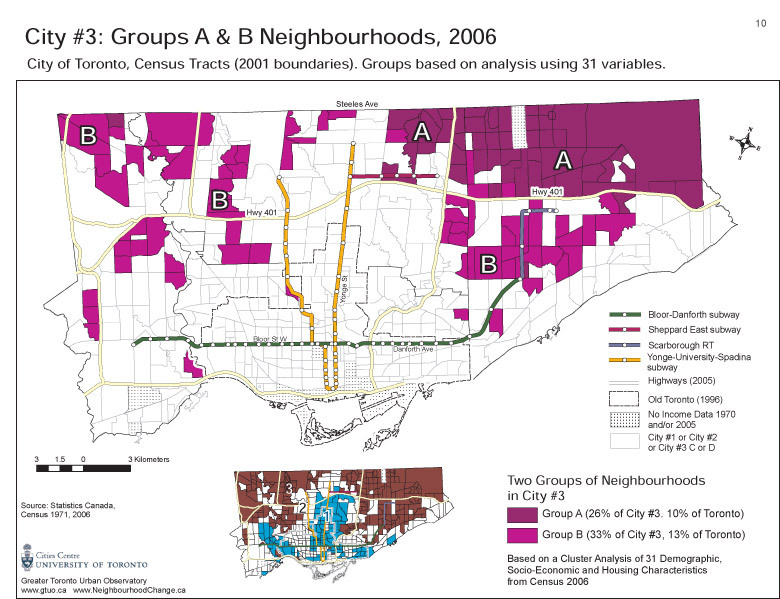 Map 1 shows that, instead of a random pattern of neighbourhood change, Toronto’s neighbourhoods have begun to consolidate into three geographic groupings. an area that from the time of its initial development has been an enclave of higher-income people. 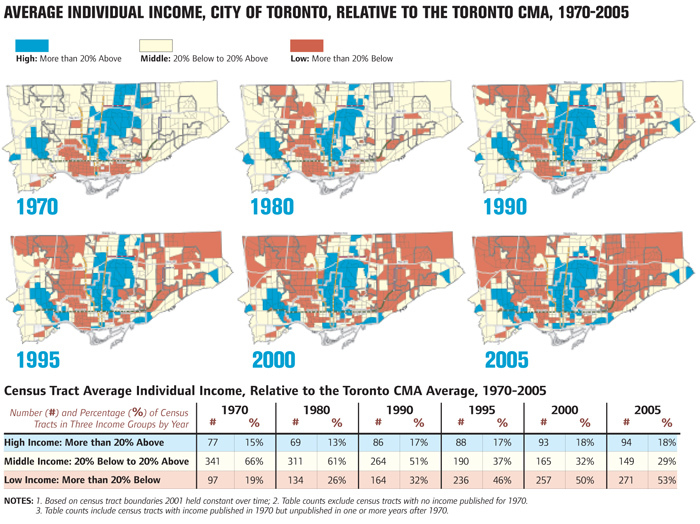 The neighbourhoods that have changed very little, that is, in which the average income of individuals 15 years and over compared to the Toronto CMA average went up or down by less than 20%, have been left white on Map 1. This is City #2. This area represents 39% of the city (208 of the 527 census tracts with census 2001 boundaries). For the most part, this group of neighbourhoods is in the middle, located between the other two groups of neighbourhoods. 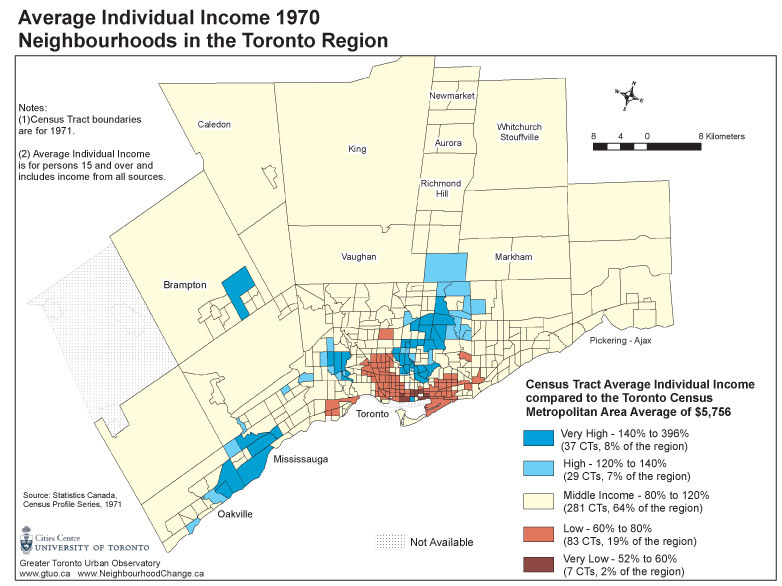 Neighbourhoods within which average individual incomes decreased by 20% or more between 1970 and 2005 relative to the Toronto average individual income are shown as solid brown on Map 1. This is City #3. 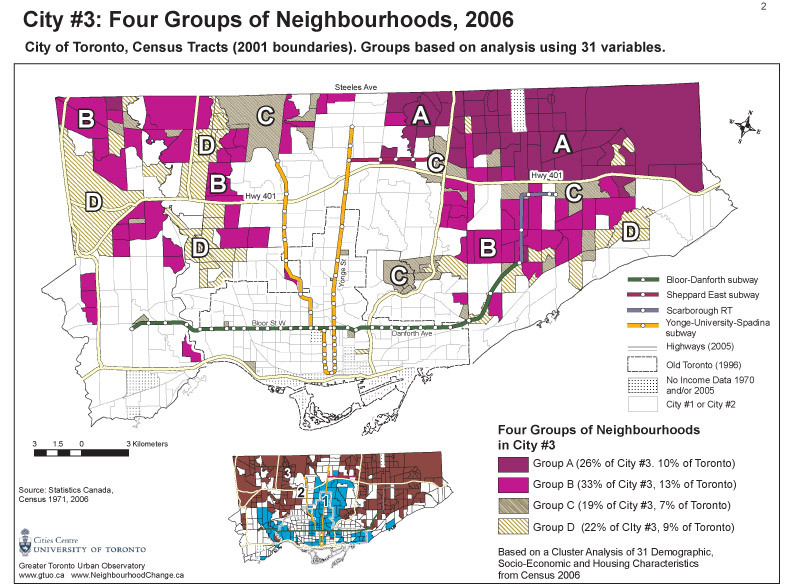 These neighbourhoods comprise about 39% of the city’s neighbourhoods (209 census tracts). They are mainly located in the northeast and northwest parts of the city outside the central corridor along Yonge Street and the Yonge Street subway. The trends shown on Map 1 are both surprising and disturbing. Surprising, because 35 years is not a long time. Disturbing, because of the clear concentration of wealth and poverty that is emerging. 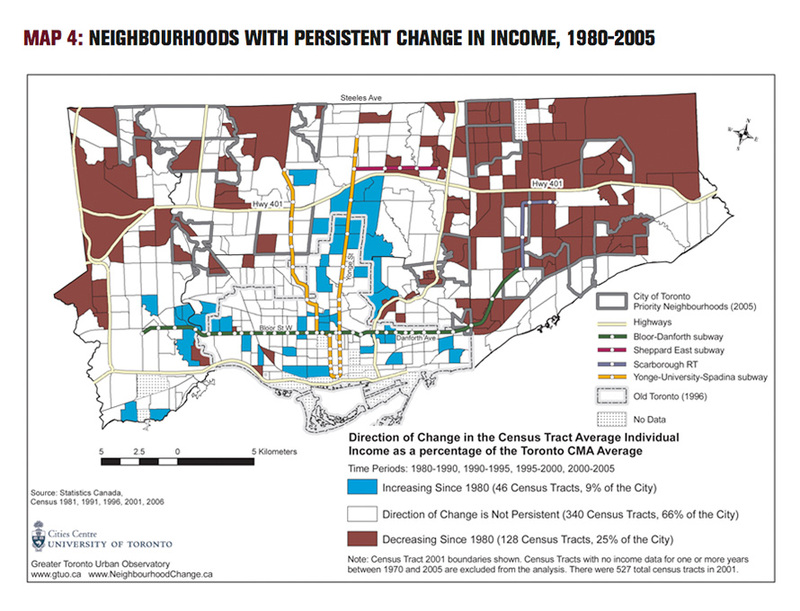 In the following section, we use individual maps for 1970 and 2005 (Maps 2 and 3), rather than the summary index of change in Map 1, to further explore the decline in “middleincome” neighbourhoods and the increase in “lower- and higher-income” areas. Neighbourhood Change > The Three Cities Home > How have the three groups of neighbourhoods changed? Maps 2 and 3 provide the same data used in Map 1 but for two specific years, 1970 and 2005, rather than the summary 35-year trend. 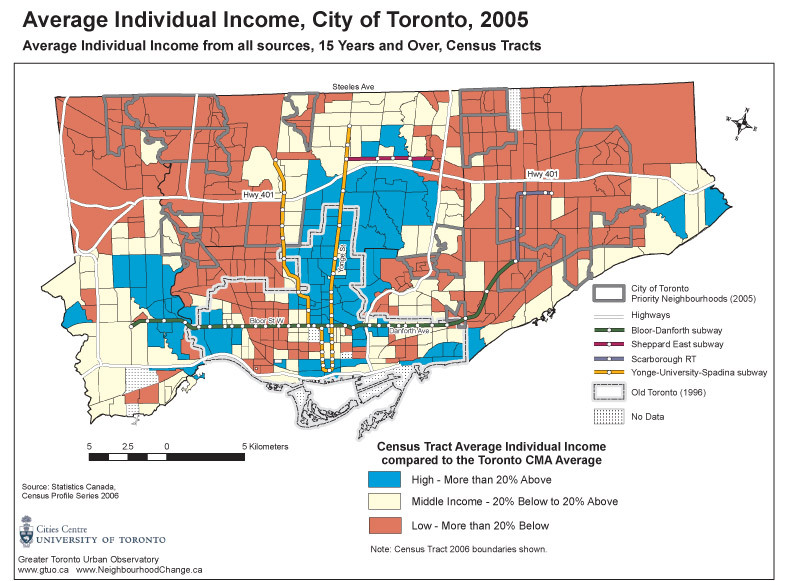 The maps for each specific year indicate in light yellow neighbourhoods that were “middle income,” that is, defined as having an average individual income less than 20% above or below the Toronto CMA average for that year. 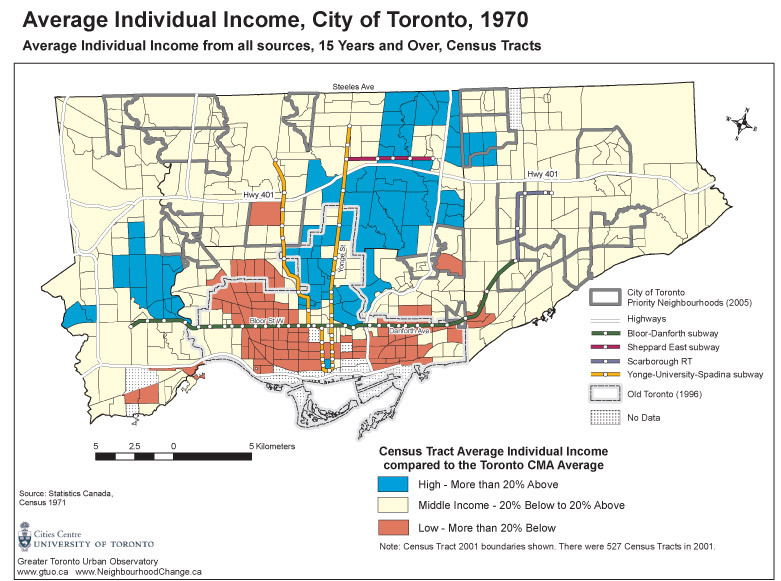 In 1970 (Map 2), average individual incomes in 66% of the city’s census tracts (341 census tracts), were close to the average income for the Toronto area. 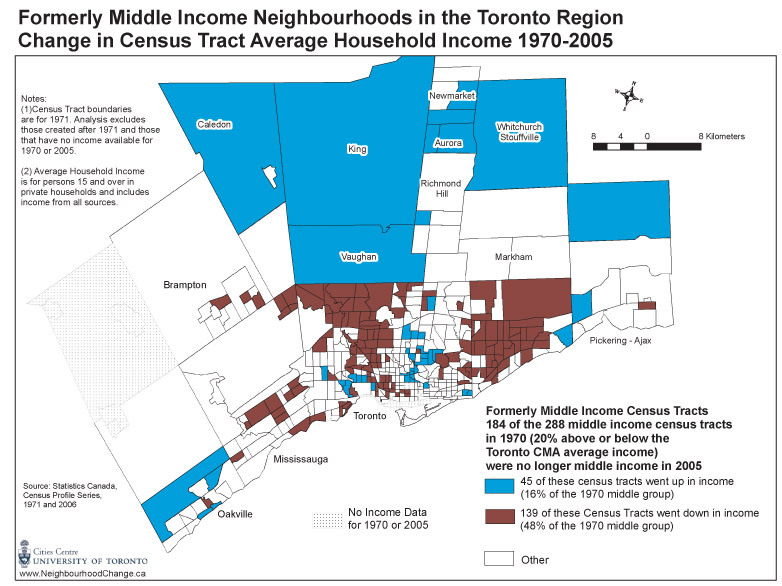 By 2005 (Map 3) the proportion of middle-income neighbourhoods had fallen to 29% of the city’s census tracts (152 census tracts). 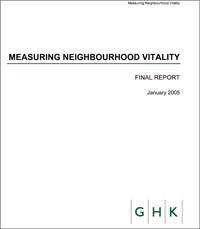 Meanwhile, the proportion of low- and very lowincome neighbourhoods increased from 19% to 53%, and the proportion of high- and very high-income neighbourhoods increased from 15% to 19%. 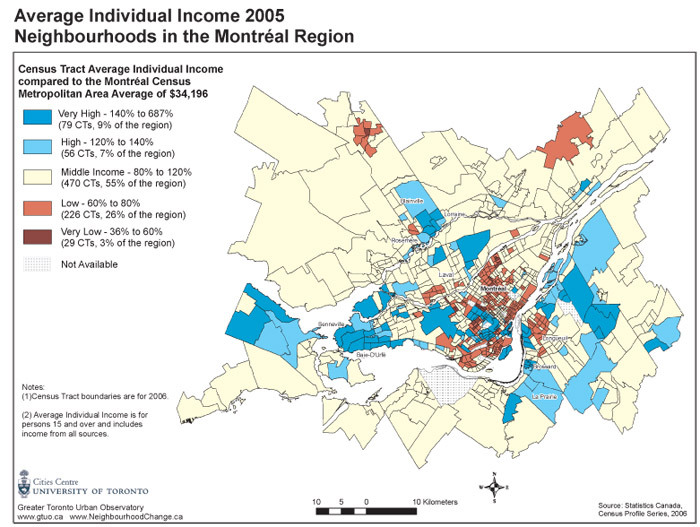 Maps 1, 2, and 3 indicate the location of the neighbourhoods in particular income groups. 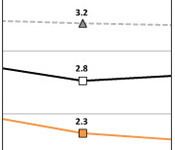 Figure 1 provides a 1970 to 2005 summary of the change in the number of neighbourhoods in each income group, together with a straight-line projection to the year 2025. The projection assumes the current trends continue. 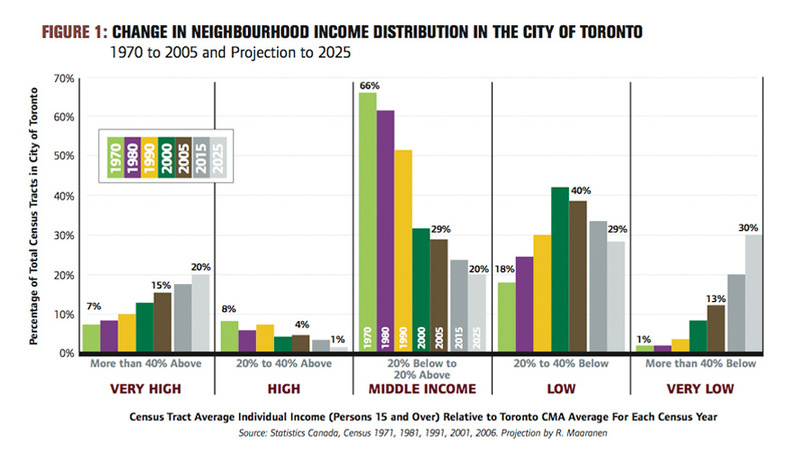 In Figure 1 we see what has happened to Toronto’s middleincome neighbourhoods — those with average incomes within 20% above or below the CMA average. 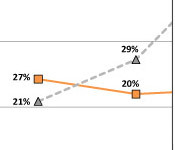 There has been a 56% drop in the proportion of neighbourhoods with middle incomes between 1970 and 2005 (shown as the middle group of bars, which dropped from 66% to 29%). 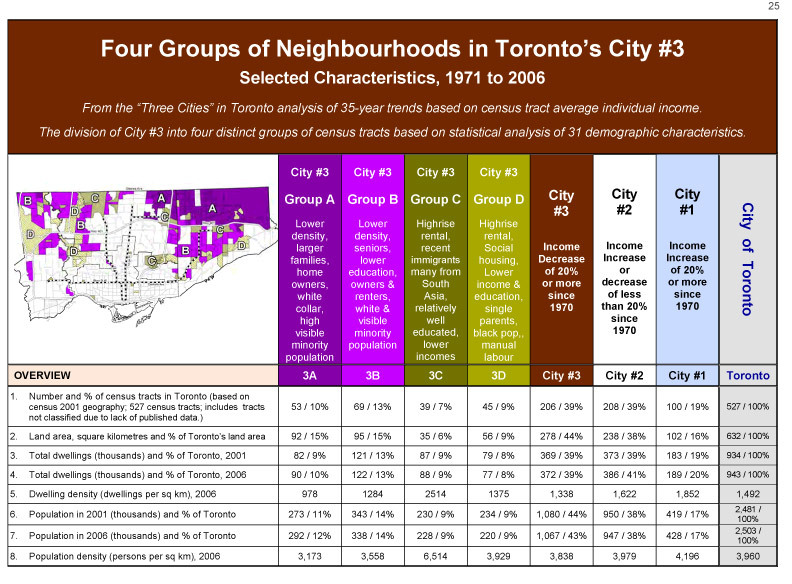 Most of this loss in the middle group can be accounted for by increases in the number of low-income and very low-income neighbourhoods, which increased from 19% of the city to 53% of the city over the 35-year period. 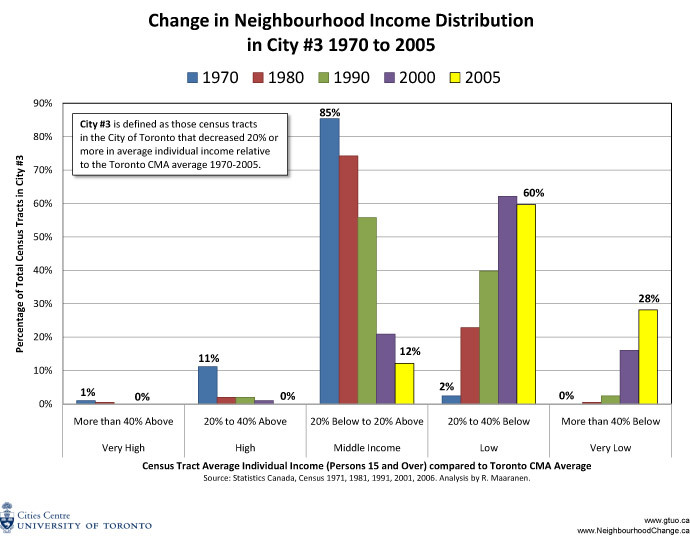 The poorest and wealthiest neighbourhoods have something in common: both were more numerous in 2005 than in 1970. 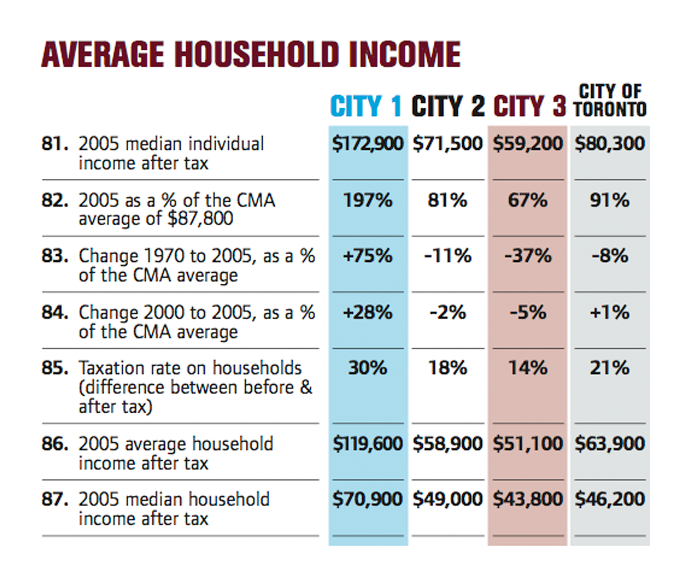 The poorest category in Figure 1 — those with average incomes of less than 60% of the CMA average — increased from 1% to 9% of the city’s neighbourhoods. Similarly, the mirror opposite eighbourhoods — those with incomes greater than 40% of the CMA average — increased, from 7% of the city to 15%. 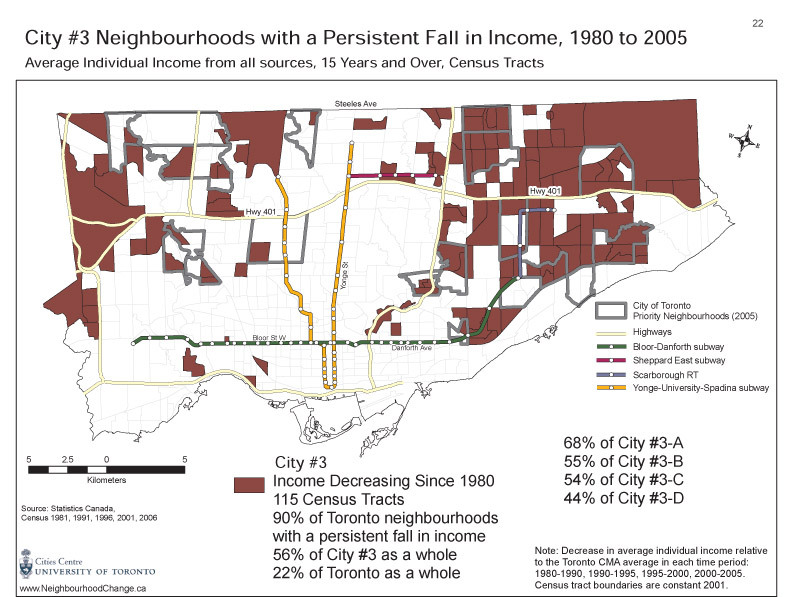 In short, the City of Toronto, over a 35-year period, ceased to be a city with a majority of neighbourhoods (66%) in which residents’ average incomes were near the middle and very few neighbourhoods (1%) had very poor residents. 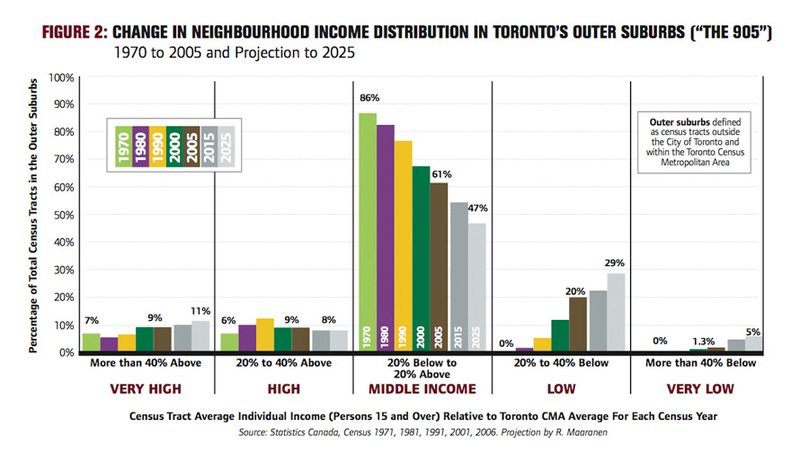 Middle-income neighbourhoods are now a minority and half of the city’s neighbourhoods are low-income when compared with the Toronto CMA average. Neighbourhood Change > The Three Cities Home > Where are Toronto’s middle-income people? Did they move to the suburbs (the “905” region)? 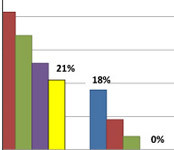 became more numerous, increasing from 13% to 18%. What this means is that middle-income people in the city have not simply moved to the outer suburbs. Neighbourhoods with incomes near the CMA average are far less numerous in 2005 than in 1970 in both the city and the outer suburbs, although the decline is more pronounced in the city. The overall trends are the same. 2006, the population of City #2 and City #3 declined slightly, while the population of City #1 increased, primarily because of new residential condominium development in the central area of the city. Households City #1 households are smaller (2.3 persons per household on average), and there are more one-personhouseholds and fewer two-parent families with children than in the other two cities. City #3 has a higher percentage of singleparent families than City #1 (23% versus 14%) and also a higher percentage of children and youth (33% versus 26%). Overall, there has been a citywide 35-year decline in the proportion of children and youth under 25 years old as a percentage of the population, from 43% to 29%. Housing tenure Renters are found in most areas of the city, but are particularly prevalent in City #3, where they account for almost half of all households. Renter households spend much more of their income on housing than owners do. 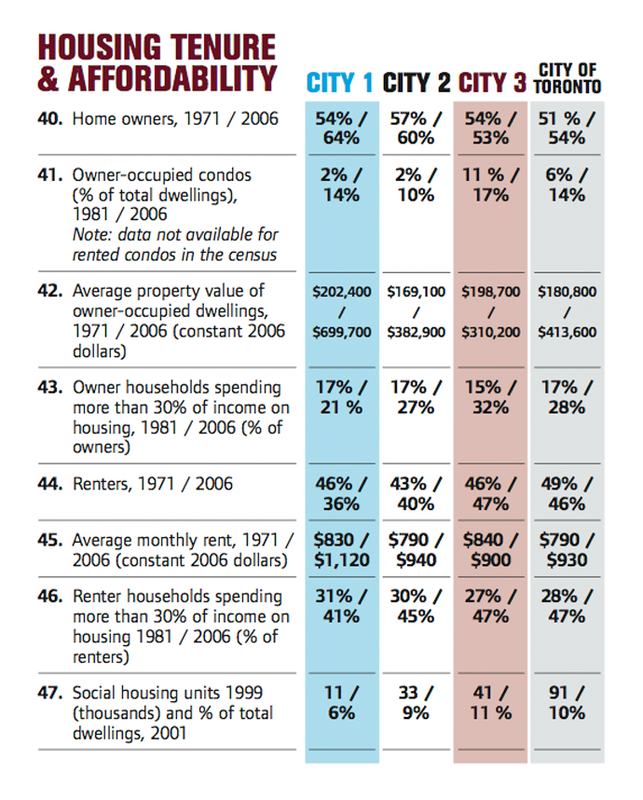 In City #3, for example, 47% of renters and 32% of owners spent more than 30% of household income on housing in 2006. In City #1, the gap is even wider, with 41% of renters and 21% of owners spending more than 30% of household income on housing. 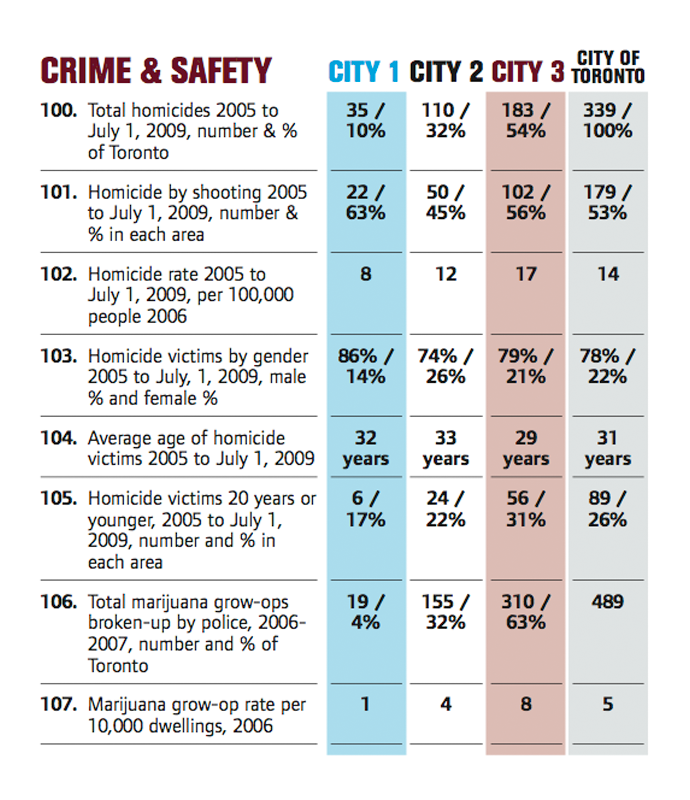 City #2 is between these two, close to the citywide average. 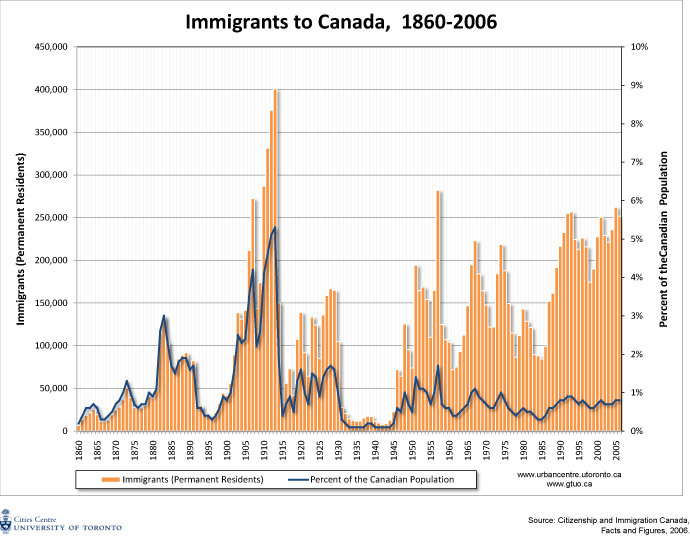 Immigrants In City #1, the percentage of foreign-born people declined from 35% to 28% between 1971 and 2006, whereas in City #3 the number of immigrants increased dramatically over the 35-year period from 31% of the population in 1970 to 61% in 2006. 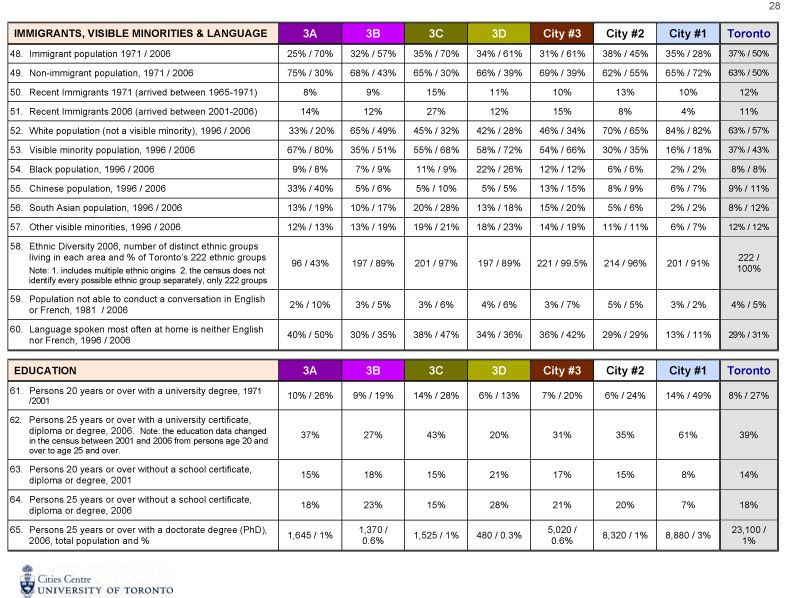 In 2006 City #2 is close to the citywide average of 50%. 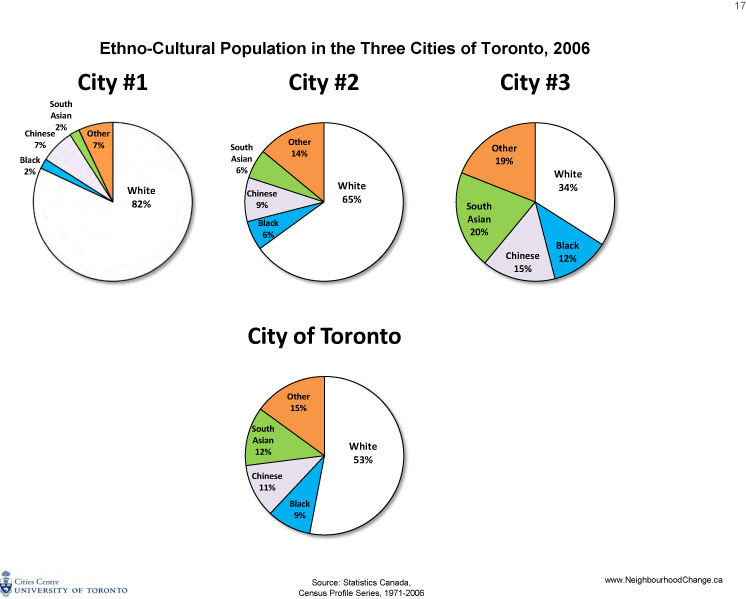 Visible minorities City #1 is mainly white (82%) whereas only 34% of City #3’s population is white. 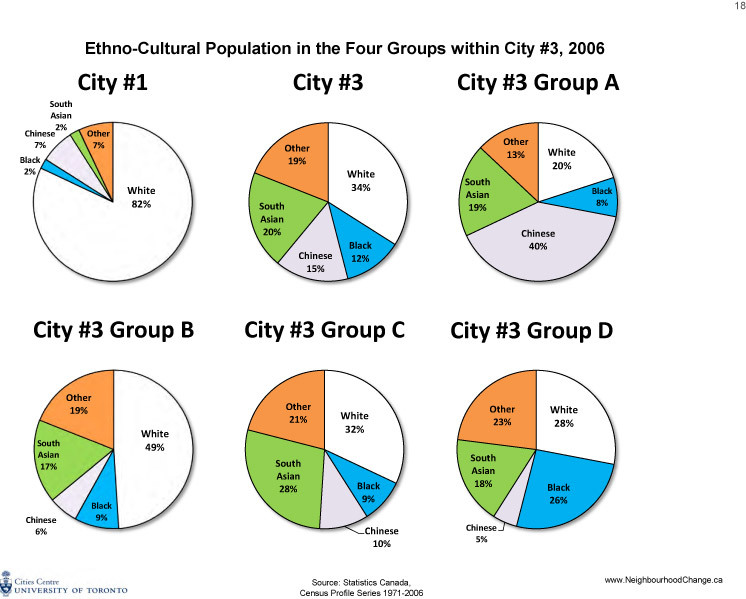 City #1 has very few Black, Chinese, or South Asian people, who are disproportionately found in City #3. 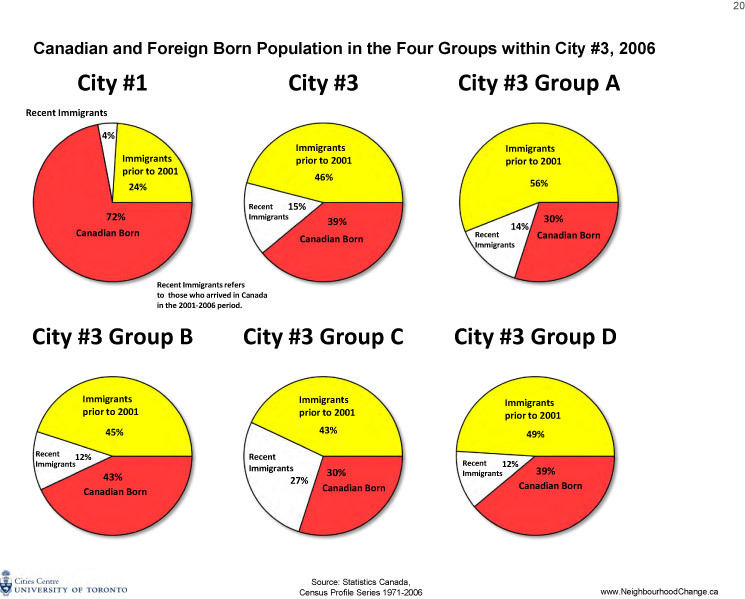 Only 11% of City #1 compared to 47% of City #3 are Black, Chinese or South Asian. 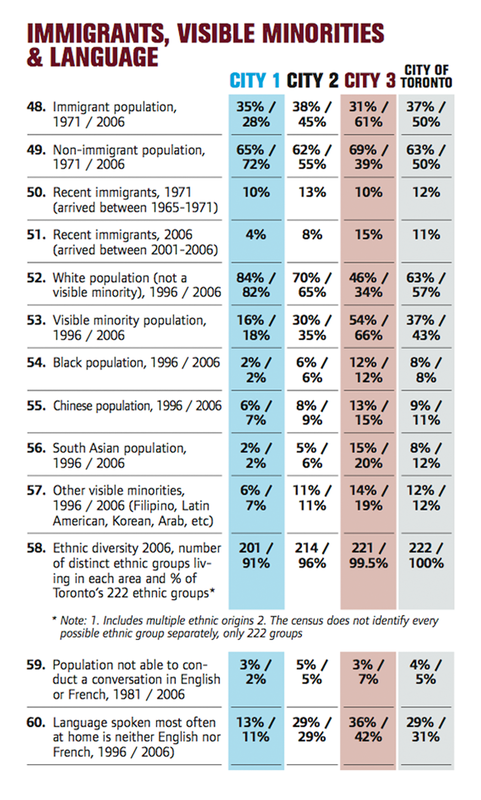 In contrast to City #1 and City #3, City #2 is close to the overall City of Toronto average with respect to visible minority population. 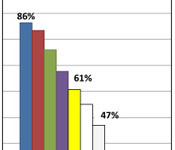 Education In Toronto as a whole, persons in their twenties and beyond were much more likely to have a university education in 2006 than in 1971. This is especially the case for City #1. 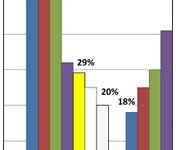 In 2006, 61% of residents 25 years and over in City #1 had a university certificate, diploma, or degree, compared to 35% and 31% of the same age group in City #2 and City #3, respectively. Consequently, the relatively large number of well-educated people in City #1 are in a much more favourable position than those in City #2 and City #3 to compete for high-paying white-collar jobs. jobs are located in City #3, with a few in City #2. 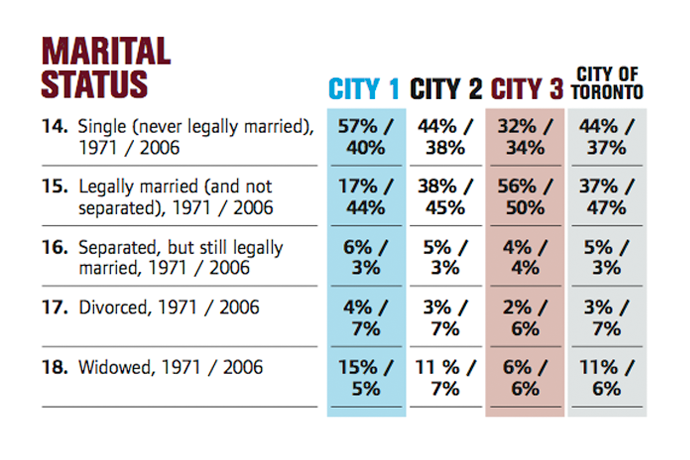 Not surprisingly, the residential population of City #3 is characterized by more blue-collar employees than City #1. The latter has a largely white-collar population, reflecting its relatively high proportion of university-educated residents. of 18%. 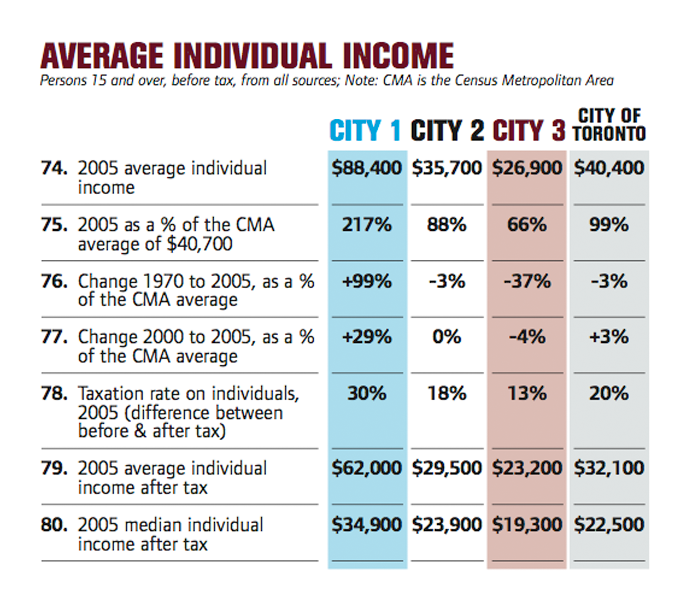 In Cities #2 and #3, average household income as a proportion of Toronto CMA income declined between 1970 and 2005, with City #3 declining the most, by 37%. This shift in income reflects both the lower levels of education among residents of City #3 and their lower occupational status. 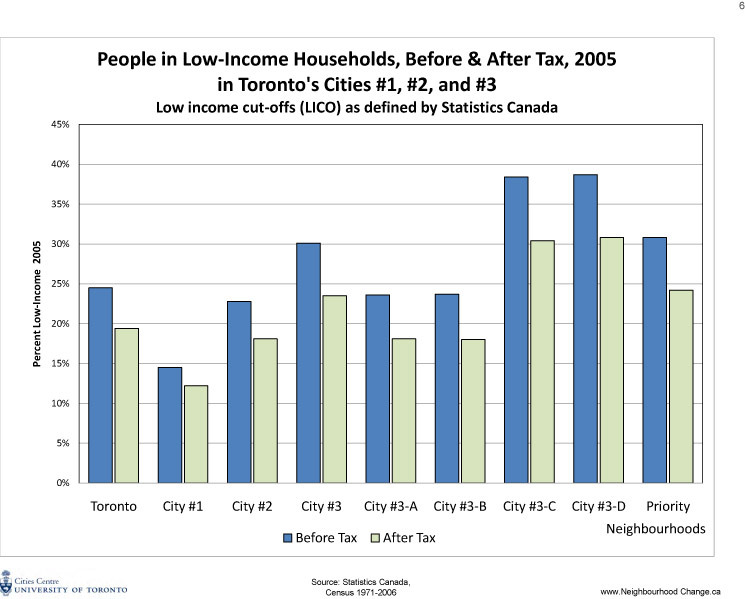 Not only have incomes declined relative to the Toronto CMA in City #3, this area also has the highest proportion of persons in households with incomes below the Low Income Cut-Off (LICO) level. Travel Residents of City #3, the neighbourhoods with the lowest average income, have to travel farther to find employment, yet they have the poorest access to the Toronto Transit Commission’s subway stations. Only 19 of the system’s 68 subway stations are within or near City #3 neighbourhoods. 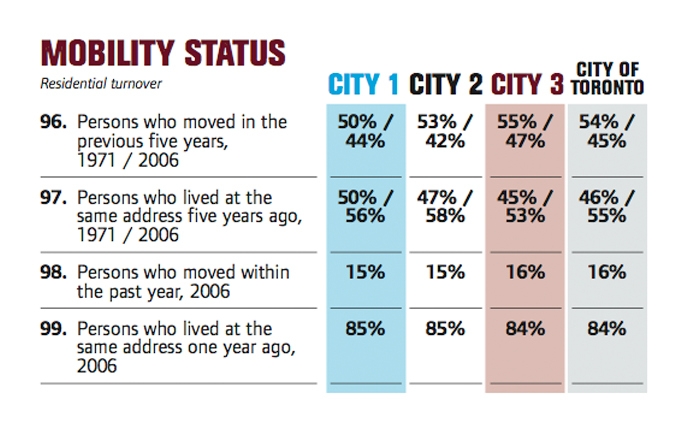 Neighbourhood Change > The Three Cities Home > A blip or a trend? Change is a constant in a dynamic city like Toronto. People move in and out of neighbourhoods in the context of everchanging economic, social, and government policy conditions. 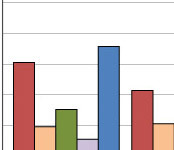 Are the trends identified here the result of a persistent pattern, or might they be a random result? 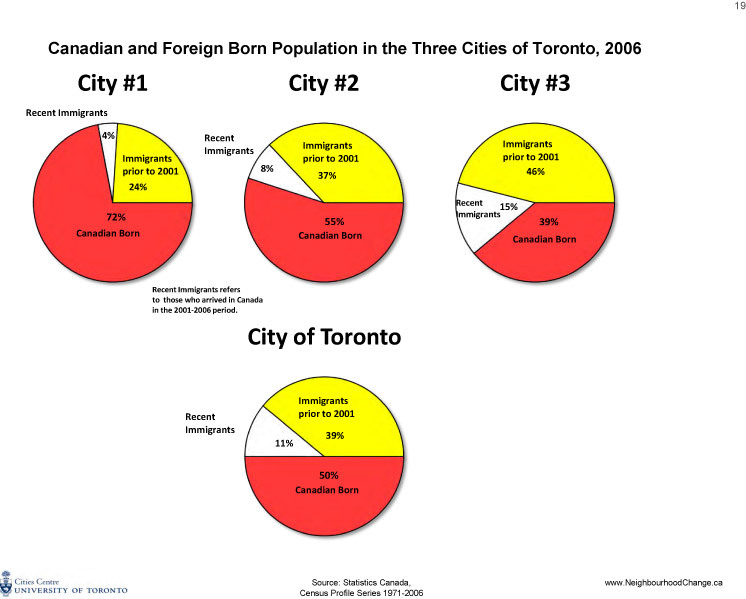 The results show that these three relatively consolidated and distinctly different cities within the City of Toronto have emerged, to a large extent, in a persistent manner. 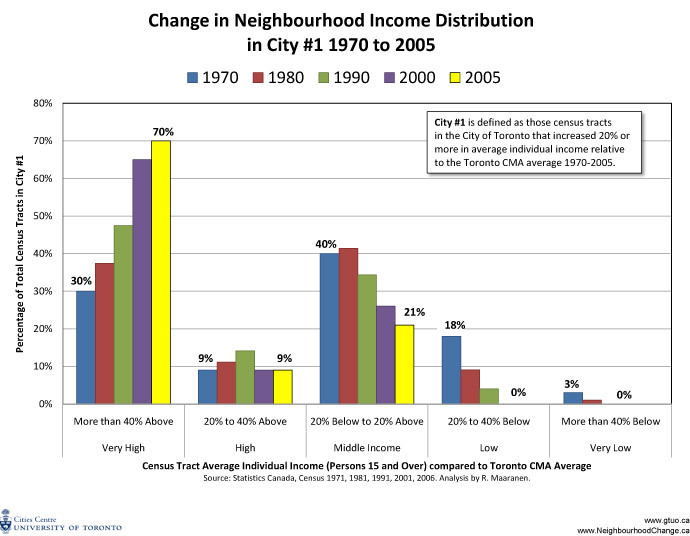 Many neighbourhoods have consistently gone up or down in average individual income compared to the CMA average individual income during each census period we studied. That is, there is no evidence that the changes represent temporary fluctuations or aberrations. 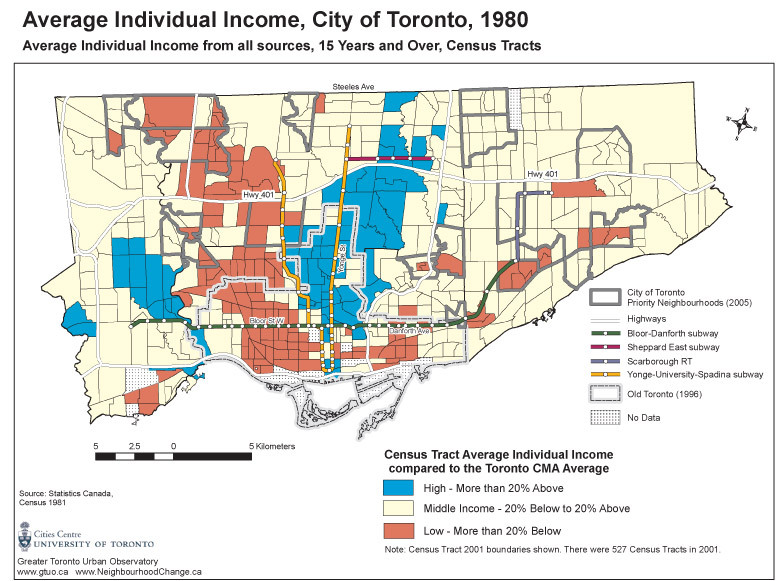 In the entire City of Toronto, over the 25 years from 1980 to 2005, for example, only 9% of all census tracts went up in average individual income consistently. Most of these are in City #1, where average incomes in 43% of the City #1 census tracts have been consistently rising for 25 years or more compared to the CMA average (Table 2, line 1). The same holds true for census tracts in which average incomes are falling. 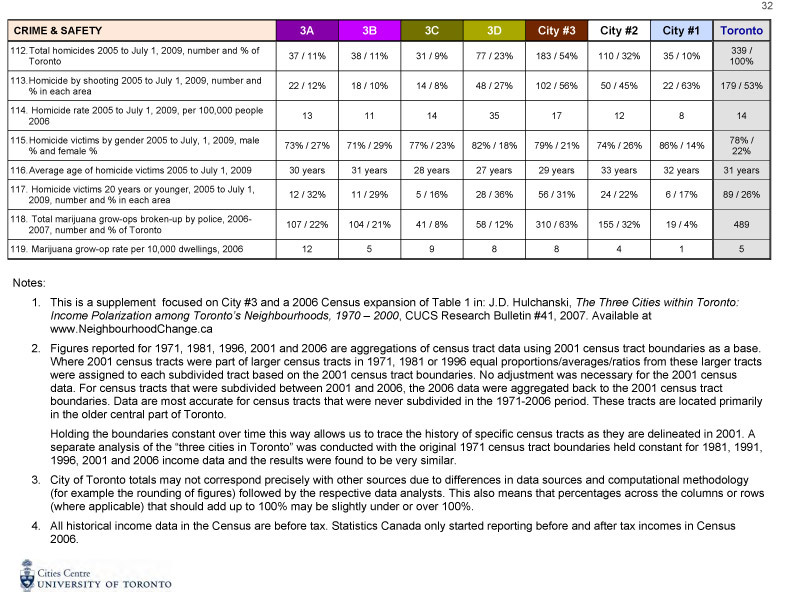 In the City of Toronto, in 25% of all census tracts, average individual income consistently went down relative to the CMA average during each census period; most of these census tracts (115 out of 128) are in City #3 (Table 2, line 2). of City #3. At the same time, some of the increases in incomes and housing prices occurring in City #1 could very well result in spillover gentrification into adjacent, relatively low-income census tracts that are part of City #2, as these areas become more attractive to middle- and upper-income people. A map showing only census tracts that have persistently gone up or down for 25 years or more (Map 4) looks very similar to Map 1. 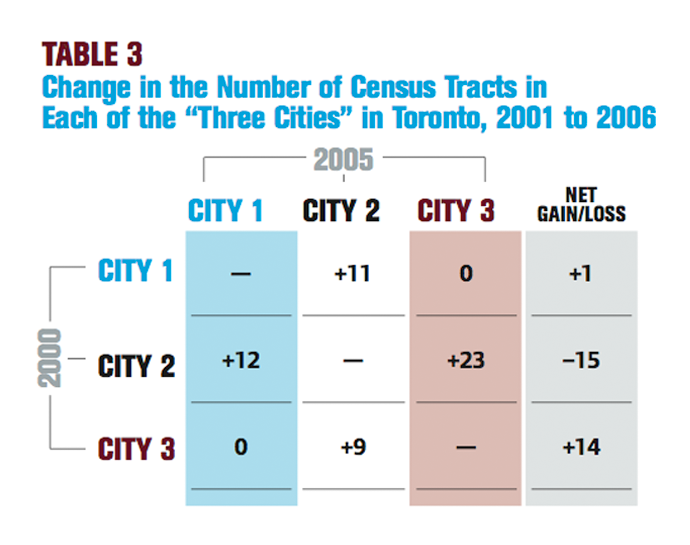 Our conclusion that the City of Toronto has polarized into three distinct cities is based on these long-term persistent trends. Five years is a relatively short time for large-scale demographic change to take place, even in a city like Toronto that during the post Second World War period has often experienced sudden and dramatic change. Therefore, it is not surprising that most census tracts (89%) remained in the same group between 2001 and 2006 — that is, the “Three Cities” remained largely the same in 2006 as in 2001.
this period and therefore shrank in size. During the same period, City #3 had a net gain of 14 census tracts and increased in size. City #1 achieved a net gain of one census tract, gaining 12 census tracts from City #2 but losing 11 census tracts to City #2. 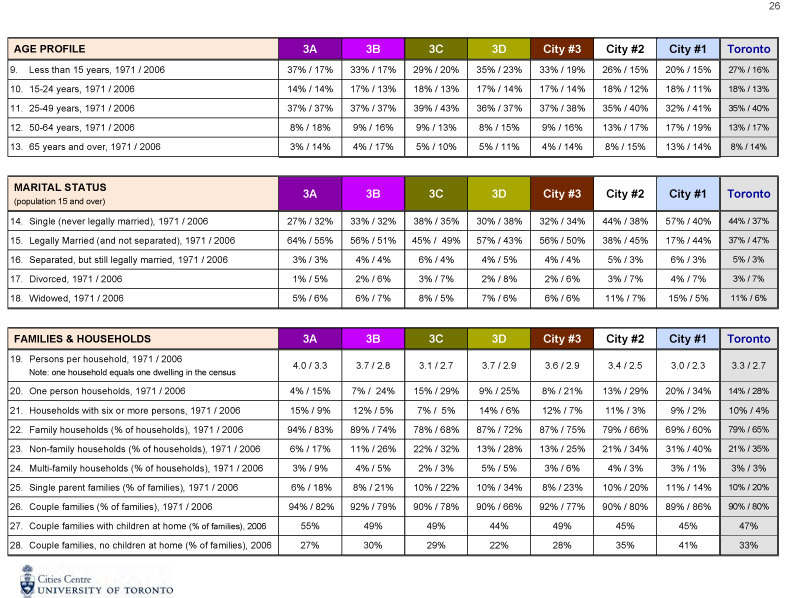 No census tracts jumped from City #1 to City # 3 or vice versa. 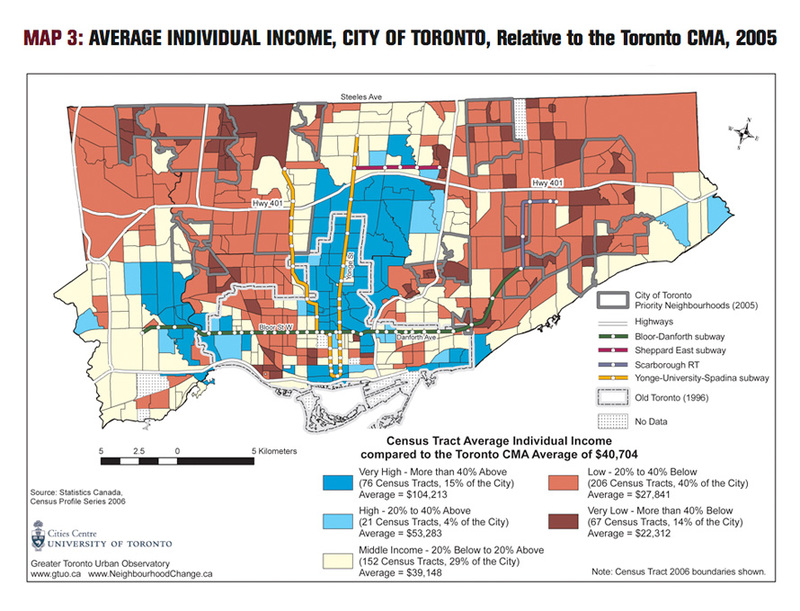 As noted in Map 5, 34 census tracts experienced a decrease in average individual income compared to the Toronto CMA, with 11 census tracts shifting from City #1 to City #2 and 23 census tracts from City #2 to City #3. 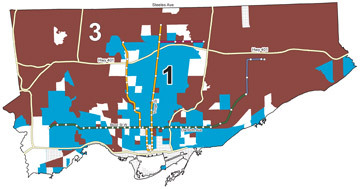 Spatially, the result of the shift from City #2 to City #3 was a further consolidation of census tracts in City #3, especially in central Scarborough and to a lesser extent, northern Etobicoke. 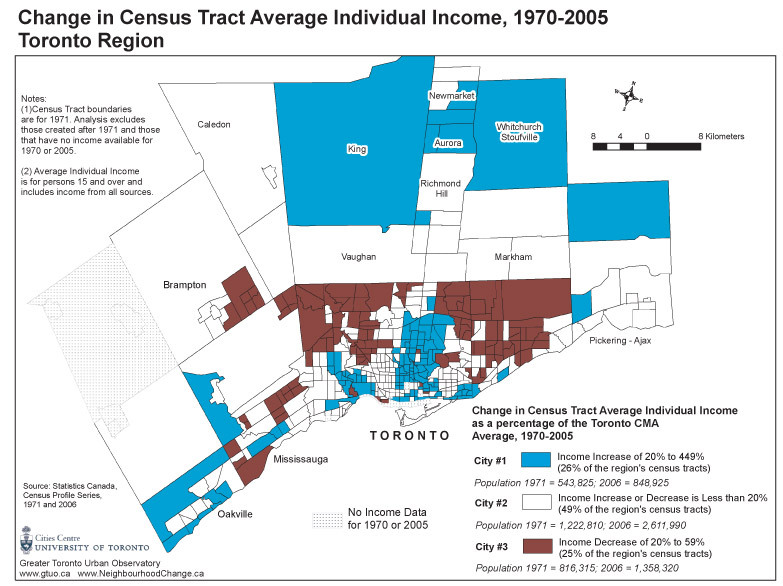 At the opposite extreme, 21 census tracts underwent an increase in average individual income compared to the Toronto CMA, with 12 census tracts being reclassified from City #2 to City #1 and 9 census tracts from City #3 to City #2. 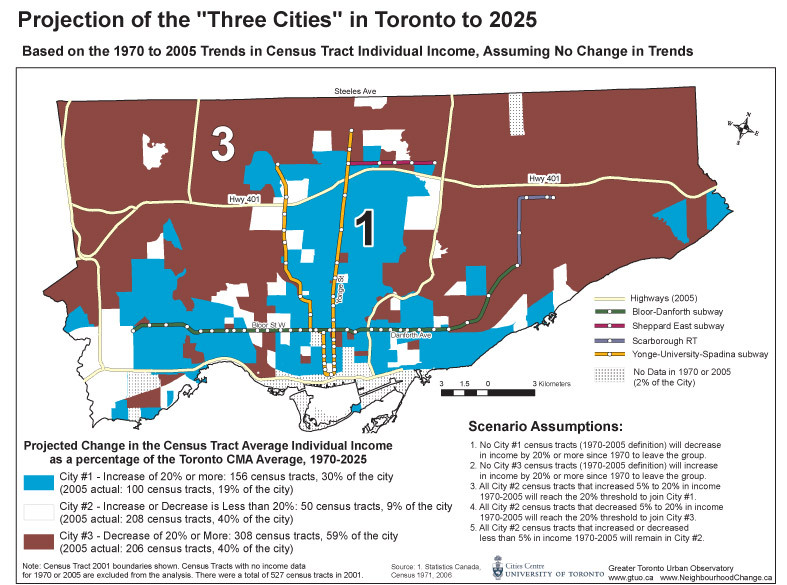 The former include areas of emerging gentrification such as Roncesvalles, High Park, and South Riverdale, while the latter are generally at the edge of former City #3.
of a city with increasing disparities between rich and poor neighbourhoods. The dramatic increase in the number of lower-income neighbourhoods in Toronto has implications for the provision of many government and community services. Maps are helpful, but can be misleading if what they depict is not fully understood. 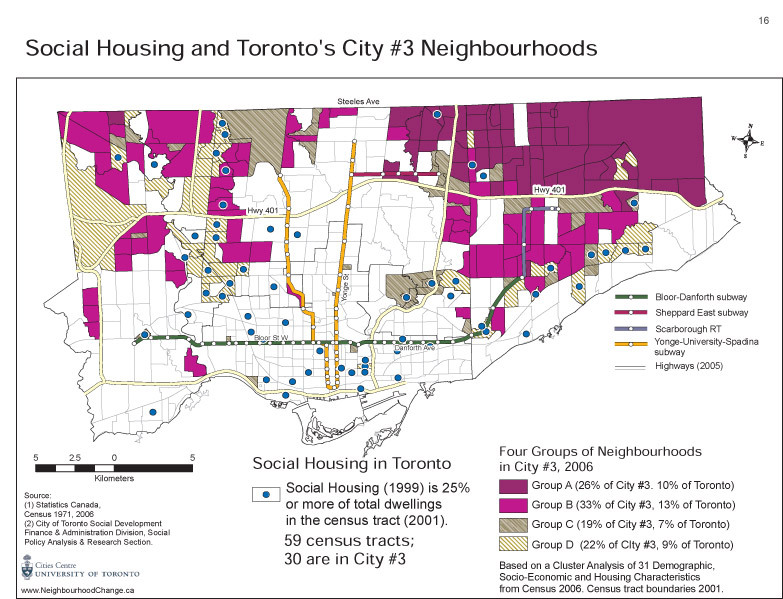 Map 6, showing the population density of Toronto’s low-income neighbourhoods, is important for people engaged in the planning, funding, and delivery of social and community services. 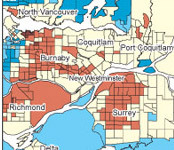 To identify the lower-income neighbourhoods in the most recent census, we need to look at Map 3. This map shows the average individual income of each census tract for one year, 2005. It is a map showing high-, middle- and low-income areas of the city. 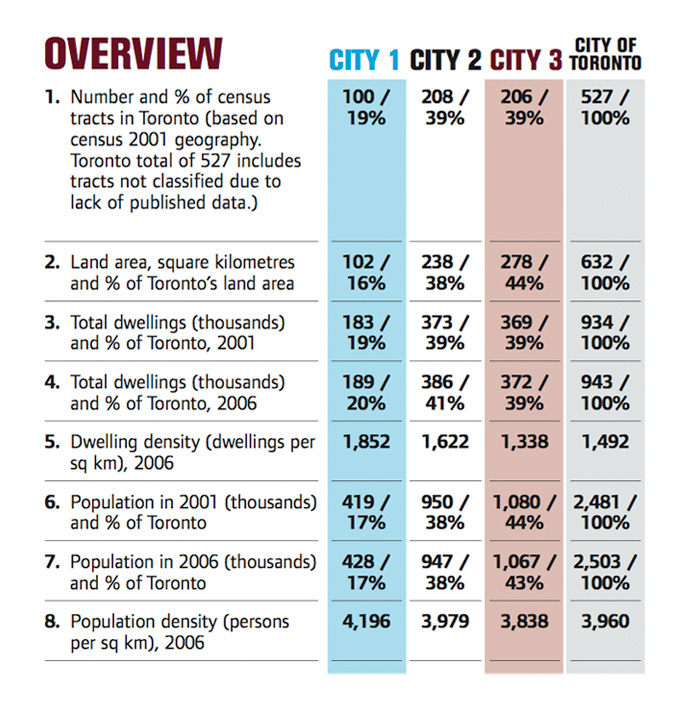 By itself, however, it can be misleading because census tracts are not all the same size geographically, even though the population of each census tract is approximately the same (averaging 4,700 in Toronto). Map 6 corrects for the mismatch between the different geographic size of census tracts and the fact that census tracts have approximately similar sized populations. It shows only the lower income census tracts on the basis of their population density. 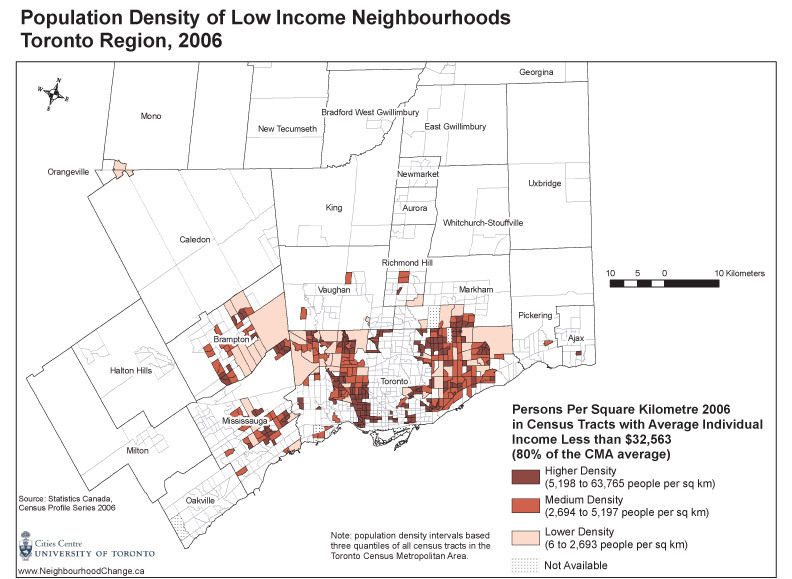 Thus, even though most of the neighbourhoods in northeast and northwest Toronto have, on average, low-income populations, much of those areas are lower density — except for the clusters of high-rise residential towers. 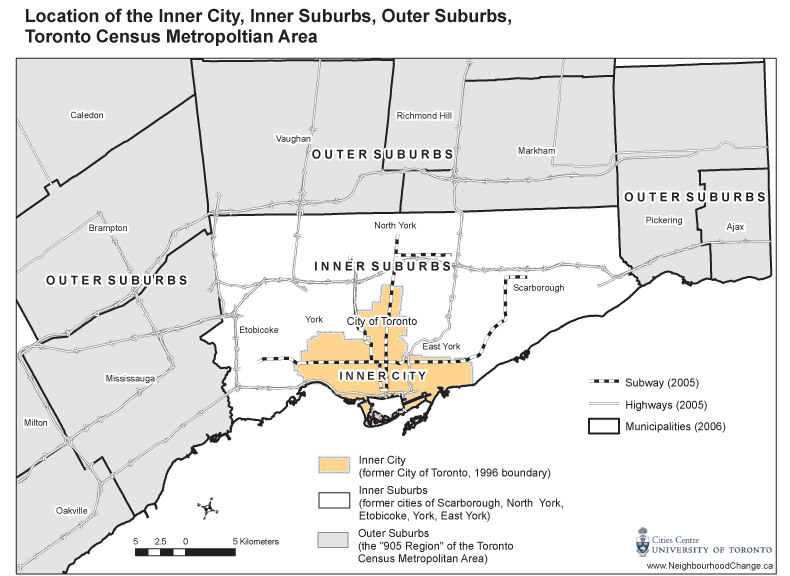 Areas south of the Danforth and areas west of University Ave. (north and south of Bloor St.) are Toronto’s traditional low-income “inner city” neighbourhoods. They continue to be high-density concentrations of lowerincome people in 2006, even though there is some gentrification occurring in and around those areas. Map 1 in this report, in contrast, takes two points in time, 1970 and 2005. 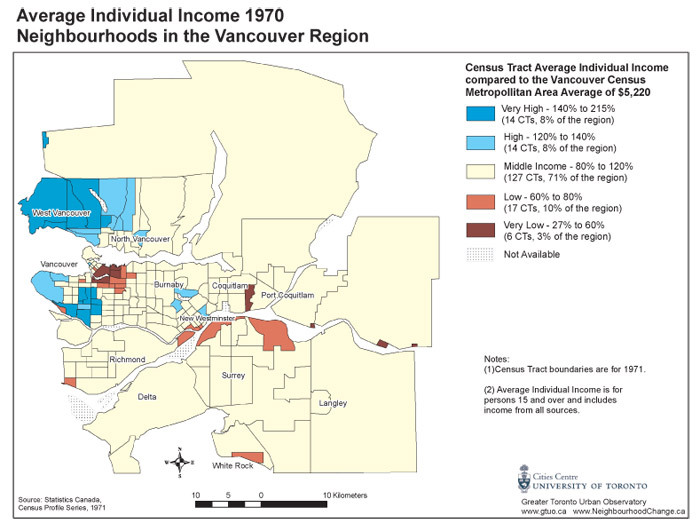 It maps trends — those neighbourhoods that have been trending upward in average individual income (coloured blue) or trending downward (coloured brown) over those 35 years. 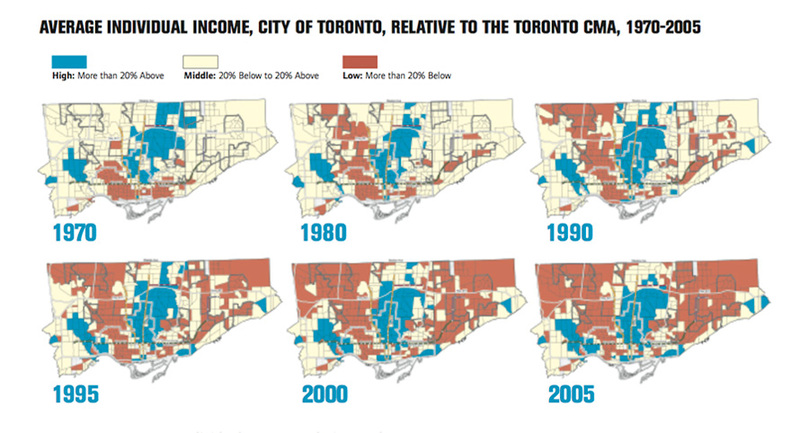 This important and dramatic map of trends, however, is not a map of low-income or poverty neighbourhoods. 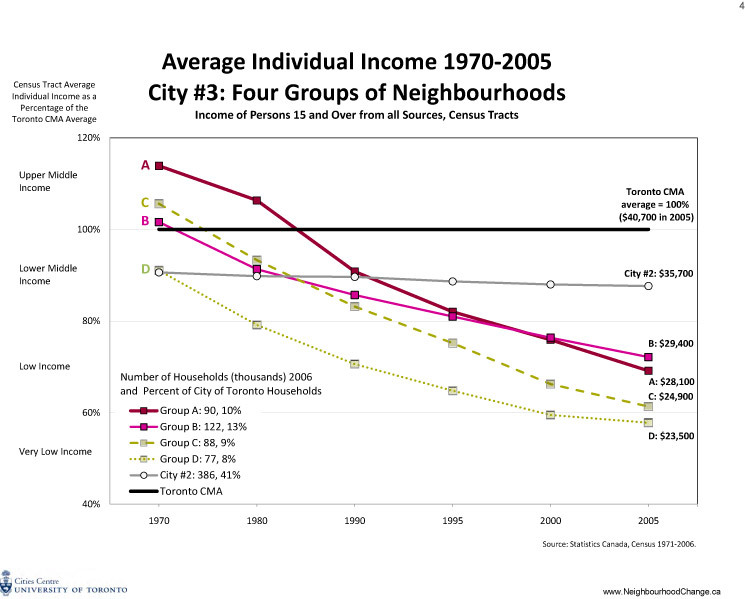 Most but not all of the neighbourhoods trending downward are indeed lower-income. 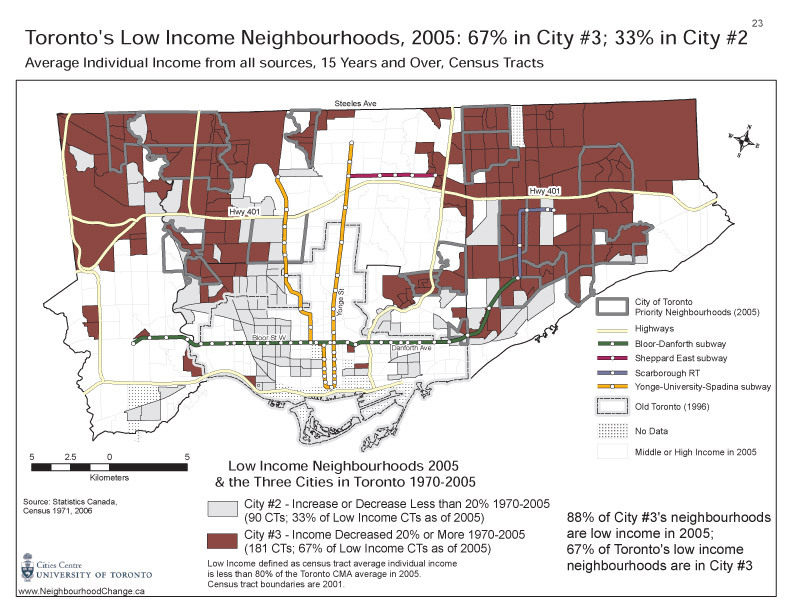 However, many of the neighbourhoods that are not trending up or down (the white areas on Map 1, which is City #2), are low-income (as Maps 3 and 6 indicate). 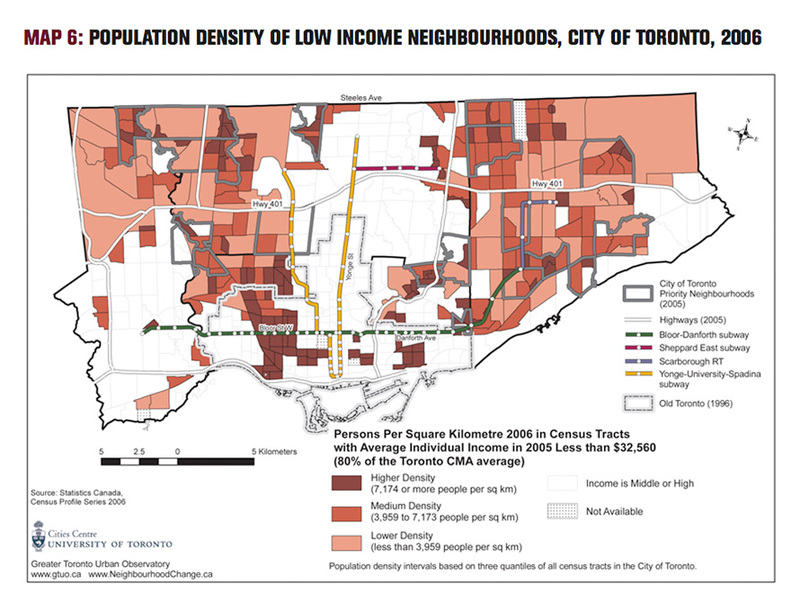 It must be noted that Map 6 is not a perfect representation of the population density of Toronto’s low-income neighbourhoods. This is because the map is based on gross population densities rather than net densities, or in other words persons per square kilometre of total land area rather than residential land area. Gross population densities are calculated by dividing the population of a census tract by the total land area of that tract, while net densities are determined by dividing the population of the tract by its residential area. The difference in methods can give dramatically different results for census tracts with a considerable amount of non-residential land use (e.g. industrial, commercial, airports, open space, farmland). In that case, net densities will be substantially higher than gross densities. 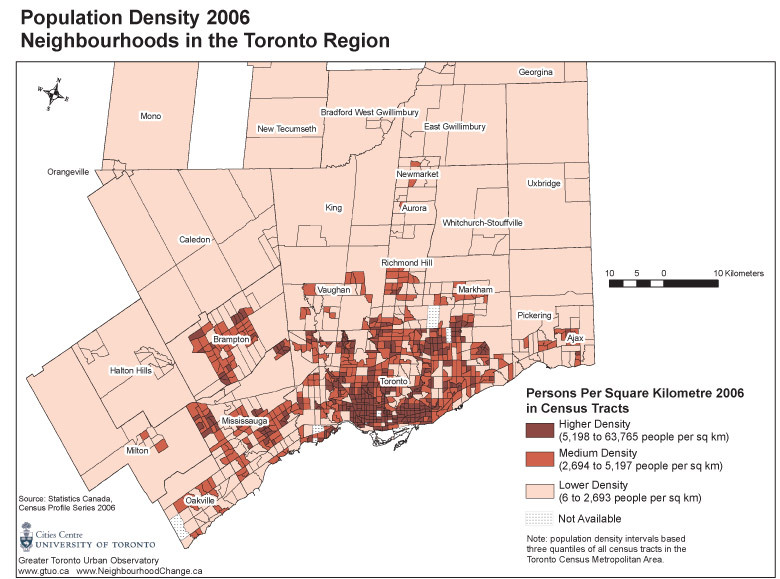 Thus, census tracts in the northeast and northwest of Toronto, which are largely non-residential, exhibit much lower densities in Map 6 than they would if net densities had been used. Unfortunately, land use information by census tract is not readily available, so net densities cannot be easily calculated. 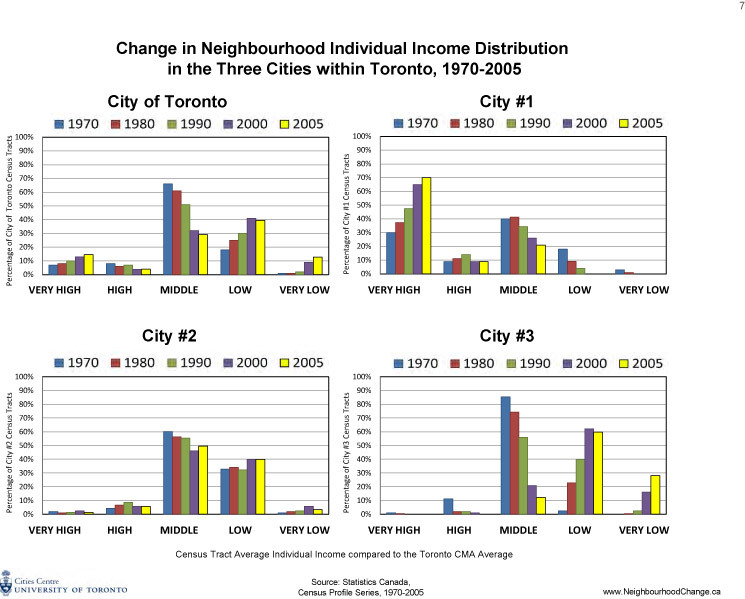 Toronto has changed, and continues to change, in terms of who lives where on the basis of residents’ income and demographic characteristics. 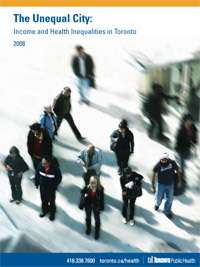 Over the 35 years of this study, the gap in incomes between rich and poor grew, real incomes for most people did not increase, more jobs became precarious (insecure, temporary, without benefits), and families living in poverty became more numerous (as the 2007 United Way report Losing Ground documents). These general trends have played themselves out in Toronto’s neighbourhoods to the point at which the city can be viewed as three very different groups of neighbourhoods — or three separate cities. This pattern did not exist before. 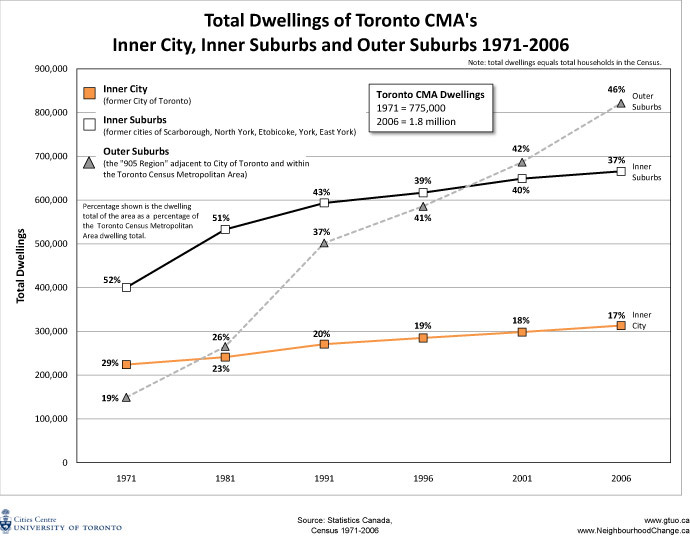 At the start of the 35 years, most of the neighbouhoods in the city, and more of the people living in the outer suburbs (the “905 region”) were middle-income (that is, they had incomes within 20% above or below the Toronto CMA average). 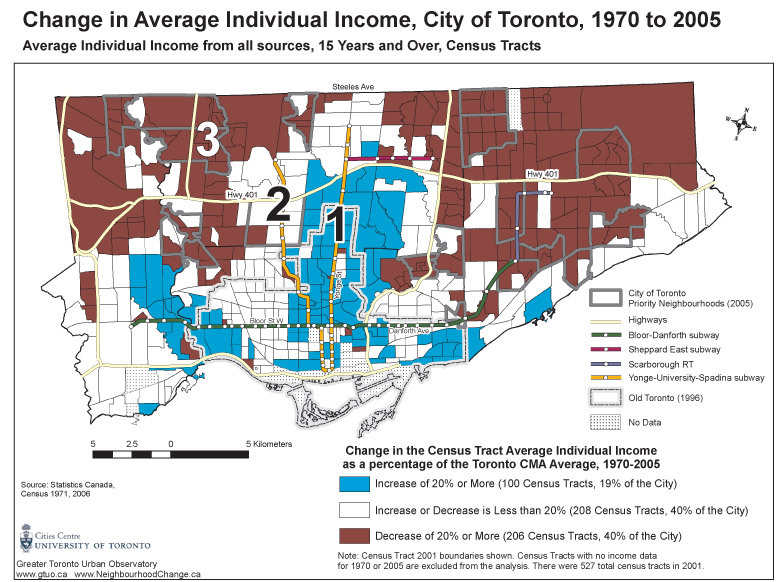 In 1970 a majority of neighbourhoods (66%) in the City of Toronto accommodated residents with average incomes and very few neighbourhoods (1%) had residents with very low incomes (Figure 1 and Map 2). 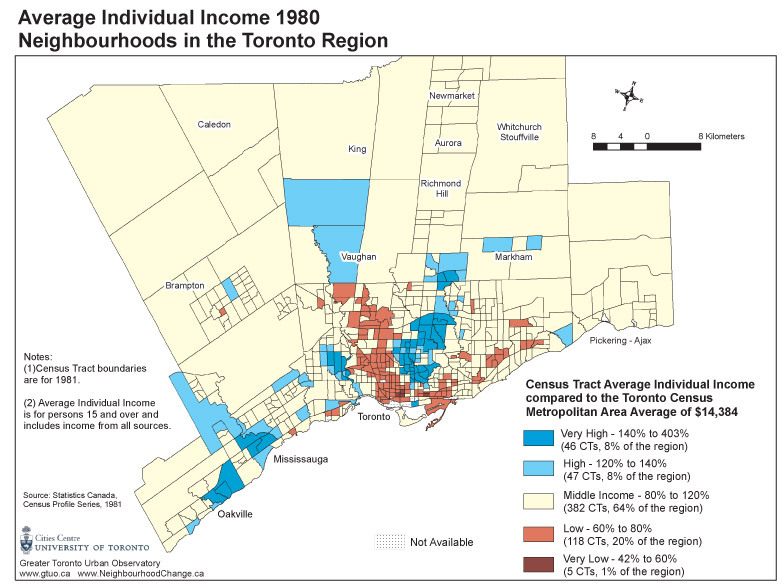 By 2005, only a third of the city’s neighbourhoods (29%) were middle-income, while slightly over half of the city’s neighbourhoods, compared to 19% in 1970, had residents whose incomes were well below the average for the Toronto area (Map 3). 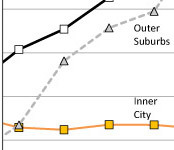 It is not the case that middle-income people in the city have simply moved to the outer suburbs (the “905 region”), since the trends are largely the same in those areas too (Figure 2). It is common to say that people “choose” their neighbourhoods, but it’s money that buys choice. 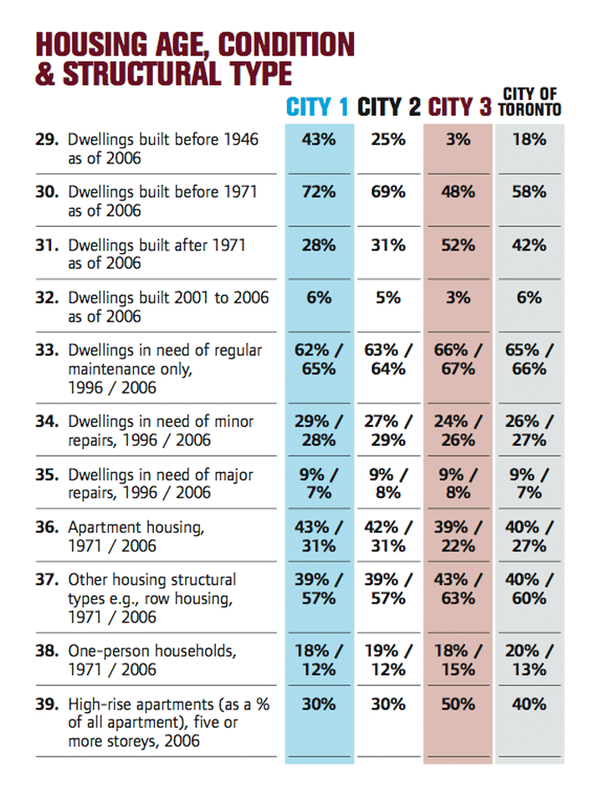 An increasing number of people in Toronto have relatively little money and thus fewer choices about where they can live. Those who have money and many choices can outbid those without these resources for the highest-quality housing, the most desirable neighbourhoods, and the best access to services. When most of the population of a city is in the middle-income range, city residents can generally afford what the market has to offer, since they make up the majority in the marketplace and therefore drive prices in the housing market. The polarization of the city need not continue. It is not inevitable. The jurisdiction and financial capacity of the federal and provincial governments are sufficient to reverse the trend. A wealthy nation can use its resources to make a difference. Income support programs that keep up with inflation and are based on the cost of living and tax relief for households in the bottom fifth of the income scale can address inequality. Assistance with households’ most expensive budget item — housing — through social housing and rent supplement programs (which exist in most Western nations), will free up more of a household’s meagre monthly income for other essentials. when a tenant moves — and thereby discourage the displacement of low-income residents in gentrifying areas. Implementation of the Transit City plan and the Tower Neighbourhood Renewal initiative are also essential for making City #3 desirable for both its residents and for a broader socioeconomic mix of households. The segregation of the city by socio-economic status need not continue. It can be slowed and reversed. 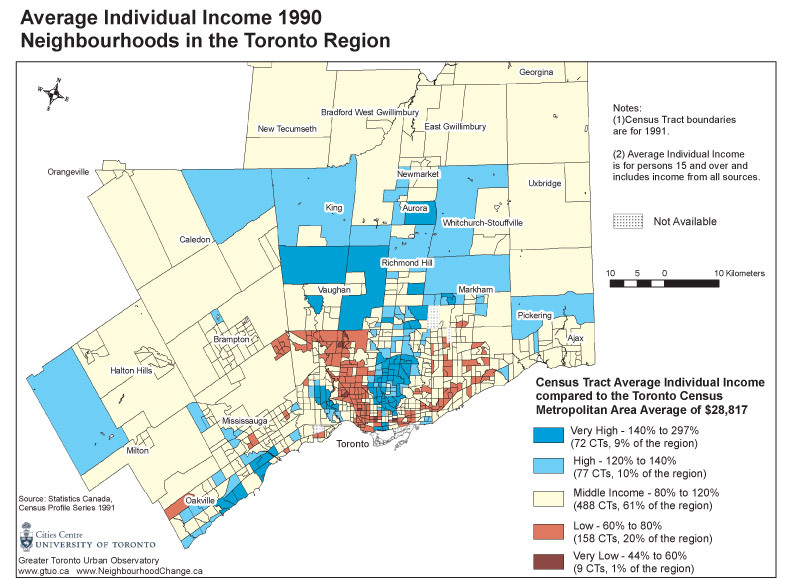 Map 1 in this report shows trends in average individual income for Toronto’s neighbourhoods (census tracts) from 1970 to 2005. What happens to the spatial patterns of the “Three Cities” in Map 1 if we project these trends forward in time — say by 20 years, to 2025? 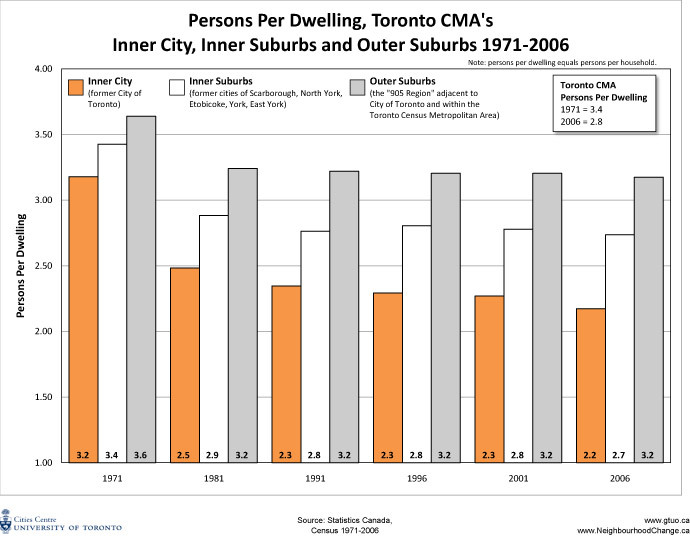 Do more neighbourhoods within the City of Toronto show either a downward or upward trend in income relative to the Toronto CMA? Map 7 indicates clearly that this is what would happen under the assumptions outlined below. leave either group. 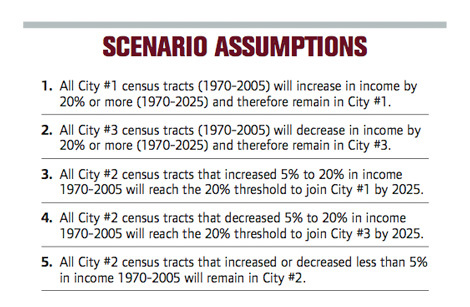 The question then becomes: what will happen to census tracts in City #2 during this 20-year period? 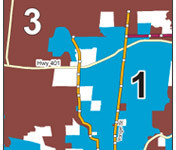 Three possibilities for City #2 are combined to produce the projection in Map 7. 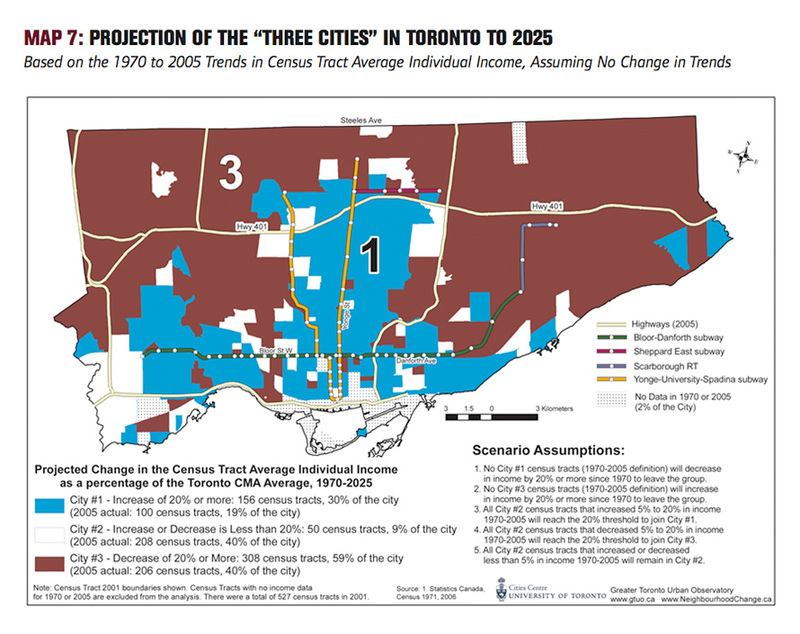 First, we assume that City #2 census tracts that increased between 5% and 20% in income in the 1970–2005 period will continue to increase relative to the Toronto CMA; they will reach the 20% threshold by 2025, thereby joining City #1. Second, we assume that City #2 census tracts that decreased between 5% and 20% will continue to decrease and reach the 20% threshold, thereby becoming part of City #3. Third, we assume that City #2 census tracts that increased or decreased less than 5% in income between 1970 and 2005 will remain in City #2. 2005 to 9% in 2025. 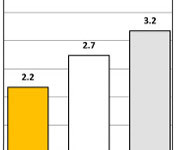 Thus, the number of census tracts in Cities #1 and #3 will increase substantially at the expense of City #2. How do these trends translate into the projected spatial distribution of the “Three Cities”? In comparing Map 1 and Map 7, we see that both Cities #1 and #3 have expanded dramatically at the expense of City #2. 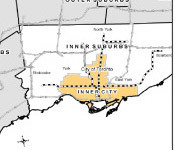 City #3 now includes almost all of Scarborough, the northern fringe of North York, and almost all of Etobicoke north of Eglinton Avenue, as well as large parts of the former municipalities of York and East York. 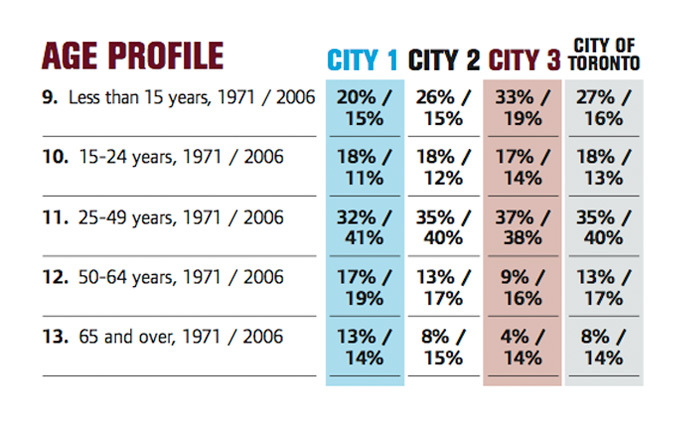 Most of the isolated census tracts that were part of City #2 in 2005 have now joined City #3. These neighbourhoods will increasingly attract newcomers, especially low-income immigrants, who cannot afford housing in the central city or the outer suburbs. residents who want good access to downtown Toronto by public transportation and the amenities of a central location. With the exception of a few pockets of social housing or lower-cost private rental high-rise units built in the 1960s, the area south of the east-west subway line is now almost entirely part of City #1. This change will have been brought about by two ongoing trends: (1) the creation of more condominium apartments, either newly constructed or carved out of abandoned industrial space, and (2) the continued gentrification of older, low-rise residential neighbourhoods. Both of these types of residential areas attract a higherincome population. In the meantime, City #2 has been reduced to a few census tracts, mostly found between Cities #1 and #3. 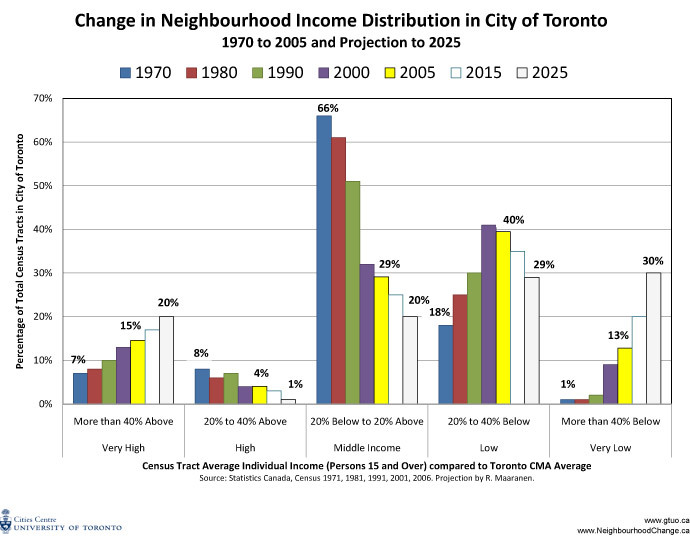 As a result, the “Three Cities” model is approaching a “Two Cities” model, in which neighbourhoods are sharply divided between those in which average individual incomes have increased dramatically over the 1970 to 2025 period and neighbourhoods where the opposite has occurred. Of course, this is just one scenario based on current trends. It assumes no changes to Cities #1 and #3, and that many census tracts in City #2 will move upwards or downwards to become part of Cities #1 or #3. In other words, it assumes no major policy changes in the next 20 years, especially policies that might lead to a more equal income distribution and a more equitable spatial distribution of an increased supply of affordable housing. 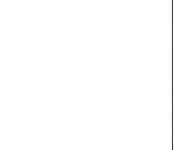 This is a reasonable assumption, since neither of these changes is on the immediate horizon. In any study, questions arise over the methods used and decisions made; we present answers to some of those questions here so that readers can assess the trustworthiness of the findings. WHY USE INDIVIDUAL INCOME INSTEAD OF EMPLOYMENT INCOME OR HOUSEHOLD INCOME? 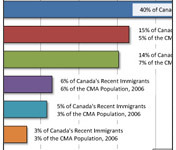 The Canadian census provides data on income in many forms, such as individual, employment, household, and family income, and breaks the data down into different subsets of the population, such as men and women, single parents and two-parent families. We used average rather than median income, because average income is provided by Statistics Canada for the entire 35-year period. In addition, for the purposes of this research, average income is a better measure than median income because it is more sensitive to the presence of very low- or very high-income persons in a census tract. Individual income is the census category for income from all sources. Employment income includes only the wage income of individuals, and excludes people on pensions or social assistance and people who receive investment income. We used individual income rather than employment income, because it is more comprehensive (including pension, social assistance, investment and employment income) and includes more people (everybody who reports income and not just those with employment income). 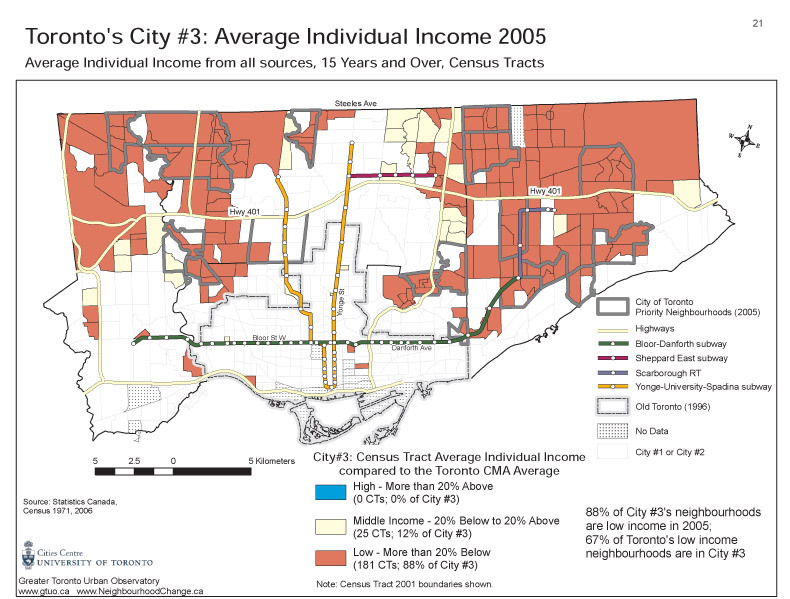 When we carried out the analysis using employment income, City #1 and City #2 were slightly larger (23% and 42% of the 514 census tracts with data) and City #3 was smaller (36%) than with individual income. We also tested the results using household income. 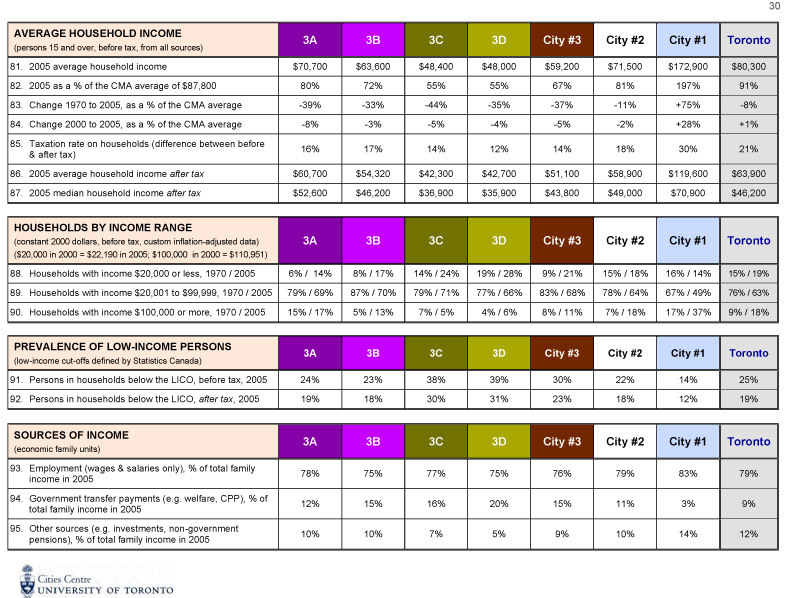 In this analysis, City #1 and City #2 were slightly smaller (15% and 39% respectively) and City #3 was larger (46%) than with individual income. This difference is due to the differences in household size between these areas (see Families & Households section in Table 1). There is, in short, no significant difference in the trends, whether we use employment, household, or ndividual income. All census tracts have some households with a few adults employed and some with only one adult. All census tracts have people who are temporarily unemployed or on social assistance or on low etirement incomes or have investment income in addition to their wages. Employment income tends to show slightly more census tracts near the middle if we use the same five income categories. Household income and individual income show very similar patterns for high and middle incomes. 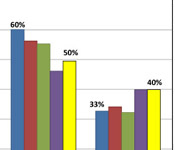 There is a slight difference in the results for low and very low incomes. 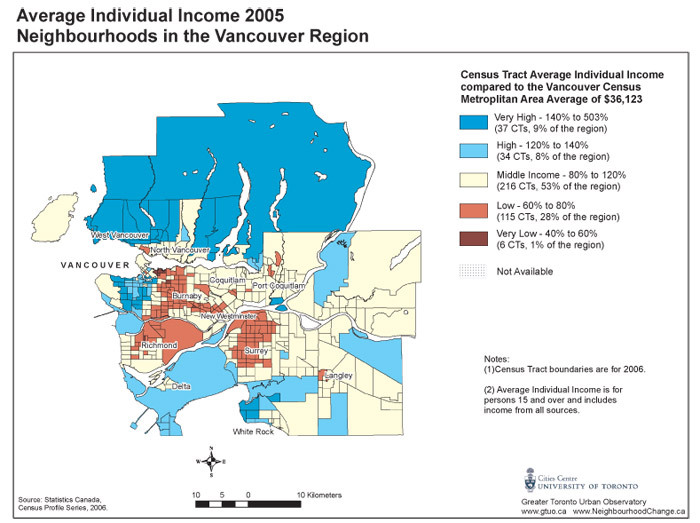 An analysis by household income shows slightly more very low-income census tracts in 2005, whereas that for individual income shows slightly more low-income census tracts. 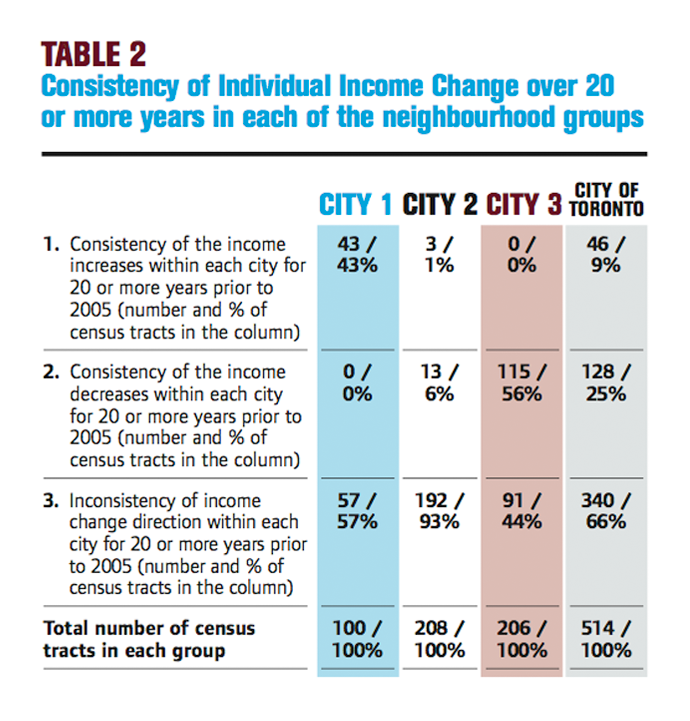 There is, therefore, no universal “best way” to measure neighbourhood income change. Furthermore, any factors that might bias the results from any one source of data tend to balance themselves out, given the large population being studied (2.5 million people in the city and an additional 2.6 million in the outer suburbs). We also used the CMA average income rather than the City average, because the labour and housing markets of the city and its outer suburbs are connected. 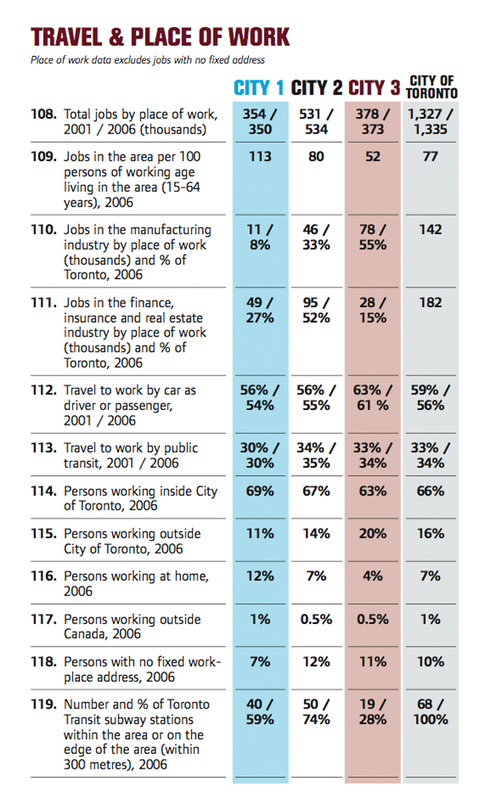 Many people living in Toronto earn their income from jobs in the suburban municipalities and vice versa. 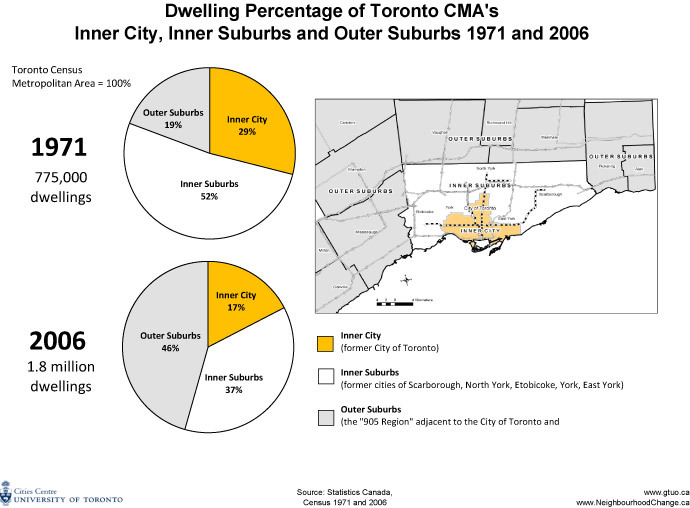 Also, using the CMA average as our benchmark allows us to compare Toronto neighbourhoods with neighbourhoods in the outer suburbs. WHAT CENSUS TRACT GEOGRAPHY DID WE USE AND HOW DO WE RECONCILE CHANGES IN THE NUMBER AND SPATIAL DEFINITION OF CENSUS TRACTS OVER TIME? 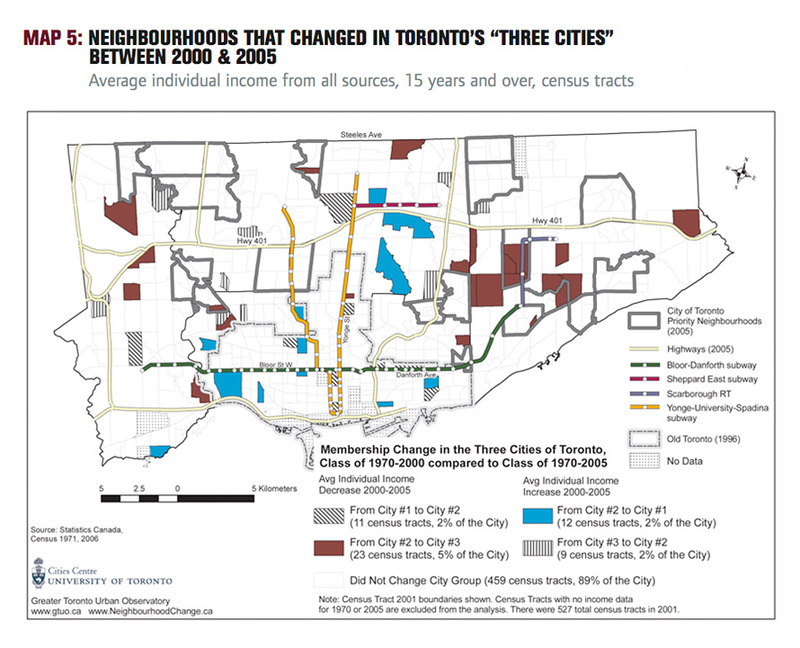 The maps in this publication are based on the 2001 census tract geography, the same geography used in Research Bulletin 41 (2007), The Three Cities Within Toronto: Income Polarization among Toronto’s Neighbourhoods, 1970-2000. 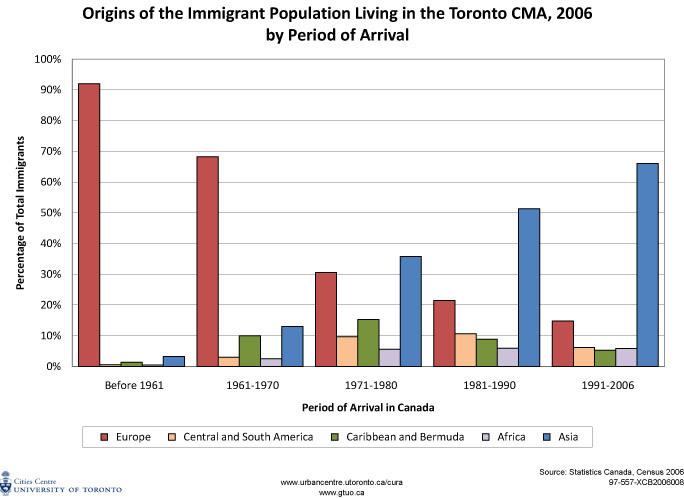 As the City of Toronto increased in population, especially in the suburbs, Statistics Canada divided several 1971 tracts into two or more tracts over the years to 2001. This alteration required some operational decisions on how to handle the 1971 income data. For the 1971 census tracts that were subdivided between 1971 and 2001, we assigned the same average income for 1970 to each of these tracts. That is, if a 1971 census tract was subdivided into two tracts by 2001, each of these tracts was assigned the same income for 1971. 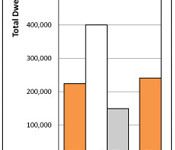 For the 2006 analysis, incomes for the few tracts that were subdivided between 2001 and 2006 were averaged and assigned to the appropriate 2001 tract. This approach introduces a small amount of imprecision to the analysis, particularly in the more recently developed northern parts of the City, but does not affect the overall trends, since most of the City was built up by 1970. The major advantage of our method is the creation of more detailed maps of change patterns, because one-to-one census tract comparisons between 1970 average income and more recent census years are possible. We did not map census tract changes using this method for the “905 region” because much of this area was undeveloped in 1970. HOW DO WE COMPARE CENSUS TRACT CHANGES OVER TIME? 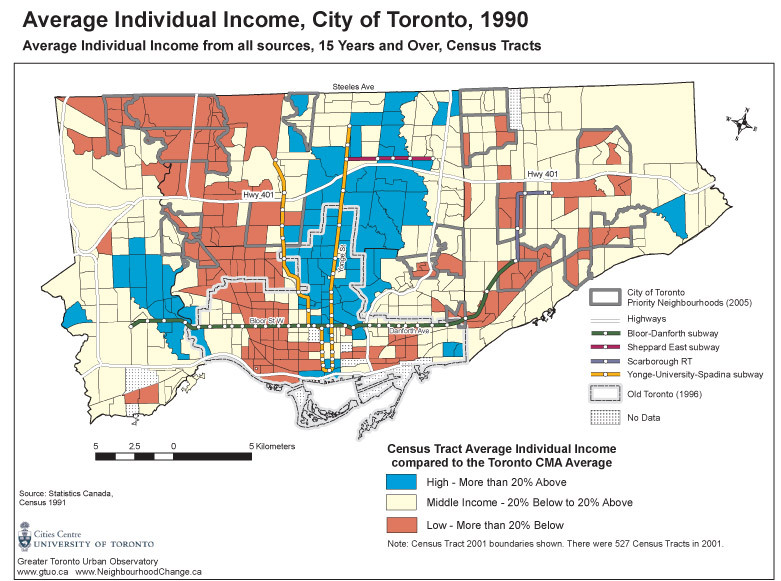 We calculated the extent to which the average individual income of people 15 years and older in each census tract in 1970 and in 2005 was above or below the average individual income for the entire Toronto Census Metropolitan Area (CMA). 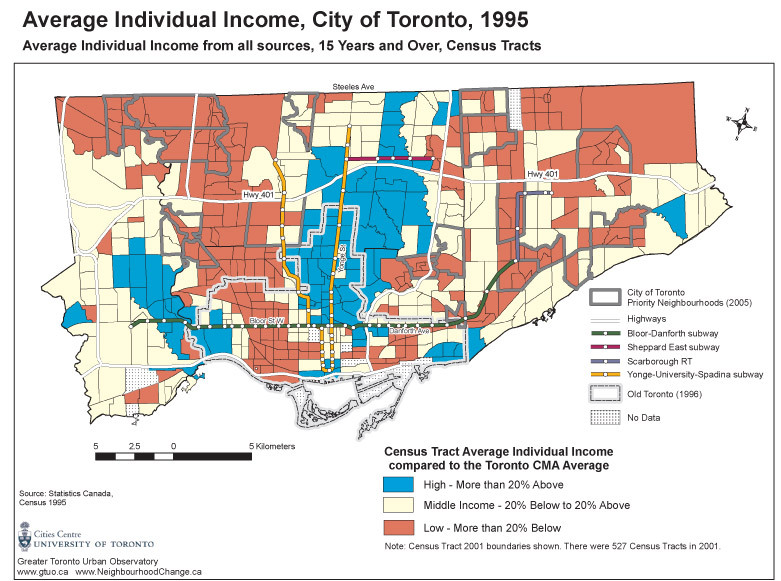 Specifically, we divided the average income for the census tract by the average Toronto CMA income for each year thereby obtaining a ratio for each year, 1970 and 2005. 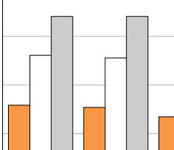 Finally, for each census tract we calculated the percentage increase or decrease in the two ratios. We examined the percentage increase or decrease in the 1970 and 2005 income ratios rather than straight dollar-to-dollar comparisons between 1970 and 2000 for two reasons. 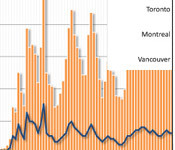 First, the cost of living in Toronto has increased over time, making a $10,000 income in 1970, for example, worth much more than $10,000 in 2005.
unless one has a benchmark that indicates whether it is high, middle, or low. 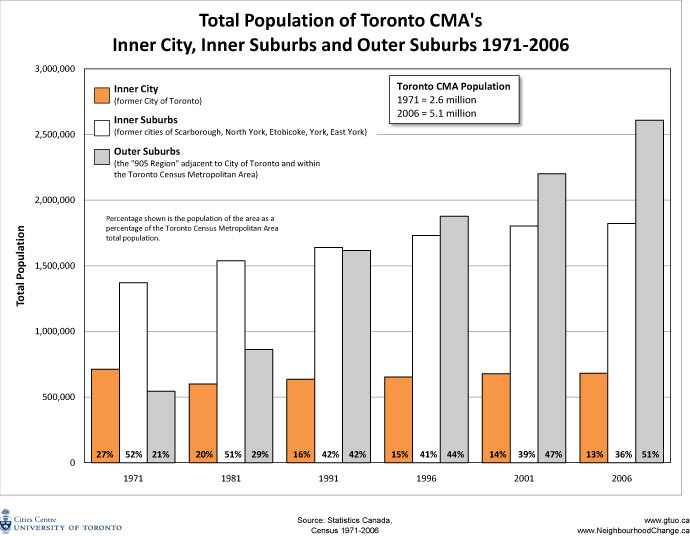 We used the average income for the Toronto CMA for an income benchmark because it takes into account the rapid growth in jobs and population in the surrounding outer suburbs — the “905 region” — which now has a slightly larger population than the City. Many people live in the area surrounding the City but earn their income from employers inside the City and vice versa. In other words, the labour market and the housing market are larger than the City of Toronto itself. WHAT CATEGORIES DO WE USE TO MAP CHANGES IN AVERAGE INDIVIDUAL INCOME? 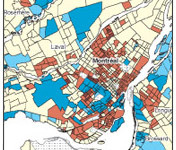 For mapping changes in average individual income (Map 1) we divided the percentage increase or decrease in the 1970 and 2005 income ratios into three categories: (1) City #1: an increase of 20% or more, (2) City #2: an increase or decrease of less than 20%, and (3) City #3: a decrease of 20% or more. While these are arbitrary boundaries, we did experiment with finer divisions of the data. Overall, the three-group categorization is a reasonable compromise and a useful public policy tool. In order to explore the trends in City #3, we have also developed a more detailed profile of City #3 as a supplement to this publication. The University of Toronto’s Cities Centre & St. Christopher House acknowledge with thanks the financial support of the Social Sciences and Humanities Research Council of Canada. The analysis and interpretations contained in this report are those of the author and do not necessarily represent the views of the financial contributors, the Cities Centre, or St. Christopher House. 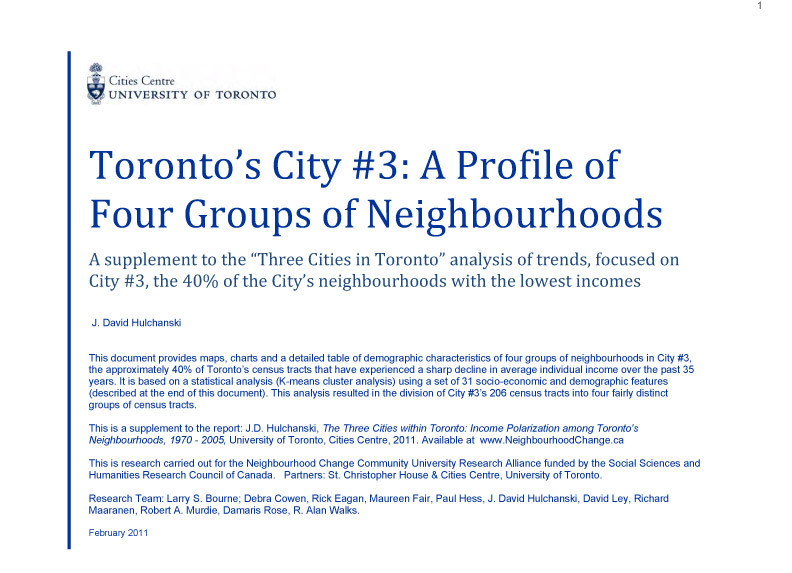 This report is a 2006 Census update of the Centre for Urban and Community Studies (now Cities Centre) Research Bulletin 41, The Three Cities Within Toronto: Income Polarization among Toronto’s Neighbourhoods, 1970 – 2000, published in December 2007. 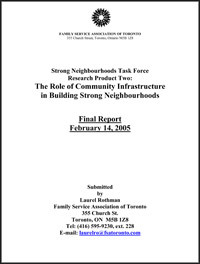 It is one output of a multi-year project on neighbourhood change in greater Toronto over a 35-year period. The research is funded by the Community University Research Alliance and the Public Outreach Grant programs of the Social Sciences and Humanities Research Council of Canada (SSHRC). 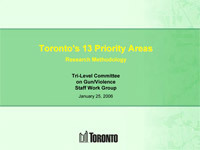 The website presentation of this report is funded by SSHRC’s Public Outreach Grant program. The core research team comprises: Larry S. Bourne, Deborah Cowen, Rick Eagan, Maureen Fair, Paul Hess, J. David Hulchanski, David Ley, Richard Maaranen, Robert A. Murdie, Damaris Rose, R. Alan Walks. • Richard Maaranen, Cities Centre Data Analyst, prepared the maps, graphs and tables. • Philippa Campsie of Hammersmith Communications edited the text. • Matthew Blackett of Spacing Media provided design and art direction for the printed report. J. David Hulchanski is the Associate Director of the Cities Centre and a professor of housing and community development in the Factor-Inwentash Faculty of Social Work, University of Toronto. His PhD is in urban planning. He holds the Dr. Chow Yei Ching endowed chair in housing at the Faculty of Social Work. 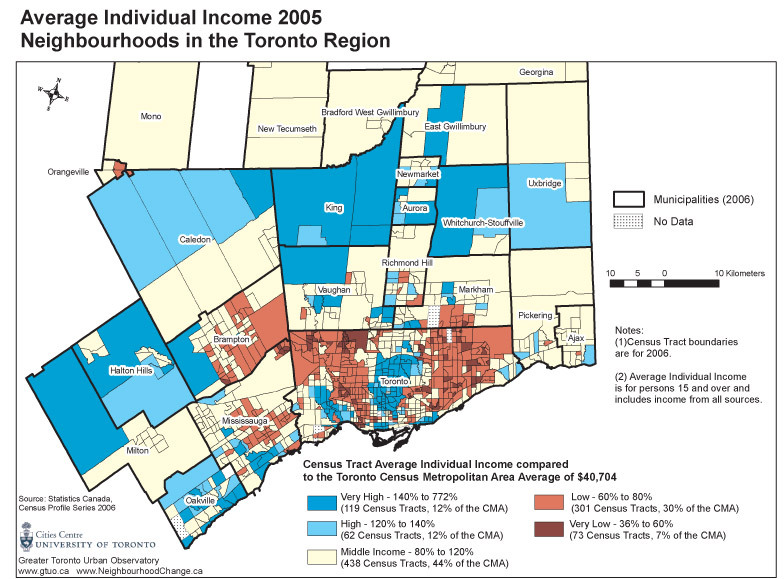 Toronto’s inner suburbs are home to many poor households, including members of many racialized groups. At the same time, social services in the inner suburbs are few and far between. 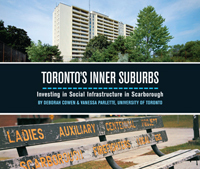 This study looks at one neighbourhood (Kingston-Galloway/Orton Park) in Scarborough, and its social infrastructure. Social infrastructure is not just the social services or programs available to residents of a neighbourhood, but the area’s resources and relationships, such as spaces for gathering, opportunities for learning, as well as partnerships and networks within and beyond the community level. Social infrastructure exists at the local scale, but relies on public policy, capital investment, and social networks that are not necessarily local. 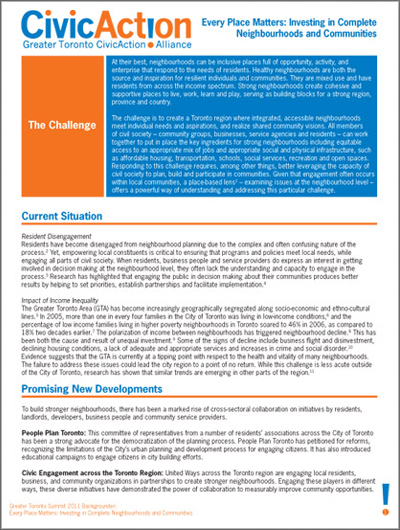 This report draws on the insights of residents, community workers, non-profit agencies and public sector staff who are committed to improving everyday life for people in Toronto’s low income communities. 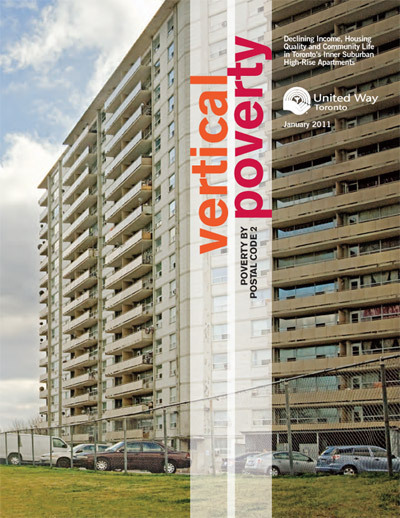 Vertical Poverty presents new data on the growing concentration of poverty in the City of Toronto and the role that high-rise housing is playing in this trend. 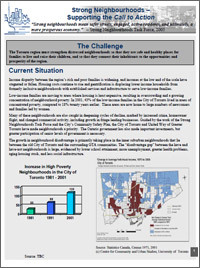 The report tracks the continued growth in the spatial concentration of poverty in Toronto neighbourhoods, and in high-rise buildings within neighbourhoods. 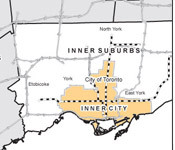 Its primary focus is on privately-owned buildings in Toronto’s inner suburbs. The geographic concentration of poverty can trigger of wider neighbourhood decline and disinvestment. This can affect the quality of the local businesses, and the condition and upkeep of housing. Understanding the extent to which geographically concentrated poverty and poor housing conditions are linked is critically important for building strong and healthy neighbourhoods in our city. At their best, neighbourhoods can be inclusive places full of opportunity, activity, and enterprise that respond to the needs of residents. The challenge is to create a Toronto region where integrated, accessible neighbourhoods meet individual needs and aspirations, and realize shared community visions. 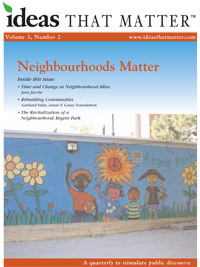 All members of civil society – community groups, businesses, service agencies and residents – can work together to put in place the key ingredients for strong neighbourhoods including equitable access to an appropriate mix of jobs and appropriate social and physical infrastructure, such as affordable housing, transportation, schools, social services, recreation and open spaces. Responding to this challenge requires, among other things, better leveraging the capacity of civil society to plan, build and participate in communities. 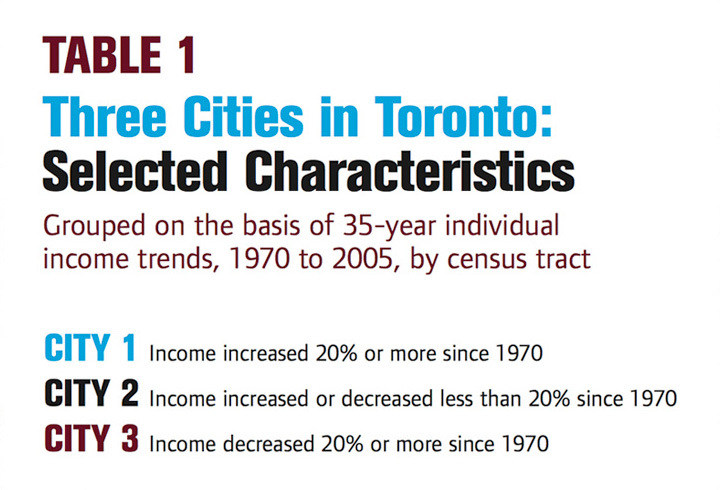 This report presents new data for the City of Toronto showing a clear link between health and income across the city. Those areas of Toronto that have a greater proportion of people living with low income experience greater risk factors for illness, higher rates of disease, and death at an earlier age. Areas with a smaller proportion of low income – areas that are relatively richer – have better health. These differences are referred to as health inequalities. The report also shows that males in the highest income areas were expected to live 4.5 years longer than males in the lowest income areas. The difference for females was 2.0 years. 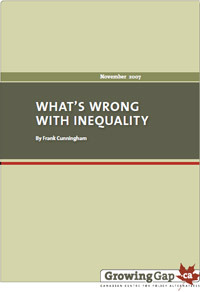 Inequality concerns persisting and widespread disparities among the resources available for people to sustain themselves and their families in secure and healthy ways, to make adequate provision for their old age, to take advantage of amenities beyond bare subsistence, to participate in political or community affairs, to engage in volunteer activities, and to pursue valued long-term goals such as succeeding in their occupations or developing talents (as for artistic enjoyment and creation or engagement in hobbies or sports). The contrast is a social ideal where, as several po­litical philosophers conceive of it, distribution of resources is sufficient for everyone to have realistic a chance of leading a meaningful, satisfying, or happy life. Three chains of events that led to the United Way’s neighbourhood focus: socio-political changes in the late 1990s; growing concern for a new deal for solutions; and federal government launch of a pilot project on neighbourhood revitalization. In 2003 the United Way adopted a new strategic plan, Community Matters. It formalized new roles of research, public policy, and community development. 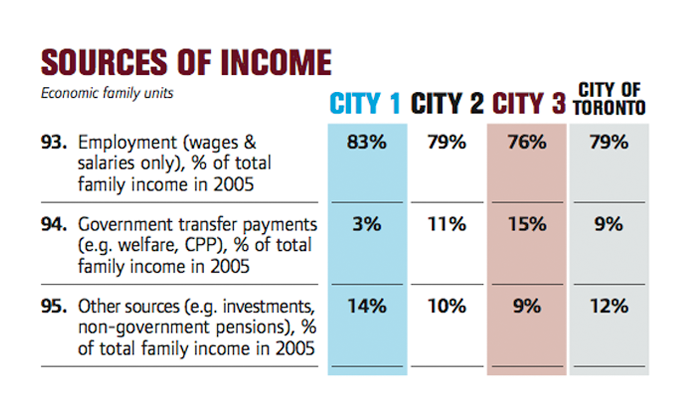 This report provides important new data about family incomes and family poverty in Toronto, Canada’s largest city. It is a story of lost ground – of a significant gap, which has opened up between the financial well being of families with children in Toronto and their regional, provincial and national counterparts. It is also a cautionary tale – one that points to warning signs that large numbers of vulnerable households are falling into serious financial trouble, evidenced by growing applications for eviction, indebtedness, and insolvency numbers. 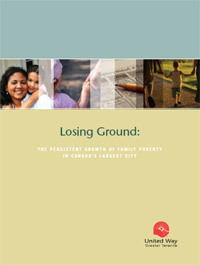 On every dimension of income examined, Toronto families lost ground, falling behind families in the rest of the country: overall family median incomes were lower, as were median incomes for both two-parent and lone-parent families, and overall family poverty rates were higher. Income disparity between the region’s rich and poor families is widening, and incomes at the low end of the scale have stagnated or fallen. Housing costs continue to rise and gentrification is displacing lower income households from neighbourhoods with established services and infrastructure to serve low-income families. Many neighbourhoods are caught in deepening cycles of decline, marked by increased crime, homeowner flight, and changed commercial activity, including growth in fringe lending businesses. 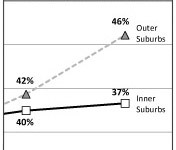 The growth in neighbourhood disadvantage is primarily taking place in the inner suburban neighbourhoods. 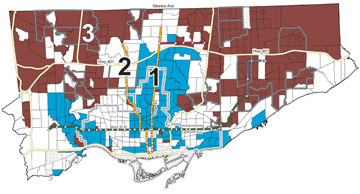 Explains how the “priority areas,” now commonly referred to as priority neighbourhoods, were selected (13 out of Toronto’s 140 defined neighbourhoods; minimum population of 7,000 to 10,000). They were defined by grouping income characteristics in combination with analysis of community infrastructure. Community infrastructure includes general services, such as community centres, libraries, schools and health centres, together with services for specific needs, such as children, youth, senior, newcomer, employment and food services. Community infrastructure is defined as a complex system of facilities, programs, and social networks that aims to improve people’s quality of life. These assets work in tandem to form the foundation of a strong neighbourhood. Municipalities developing ‘strong’ infrastructure will integrate physical and social planning and development and will invest adequately in both. In contrast, ‘weak’ infrastructure will indicate a continuing separation of the physical and social requirements of the city. Thus, for a strong infrastructure to exist in a locality it is critical that there is adequate investment in both physical and social types of infrastructure. The report provides a review of international, national and local practice in the use of indicator systems at the neighbourhood level. 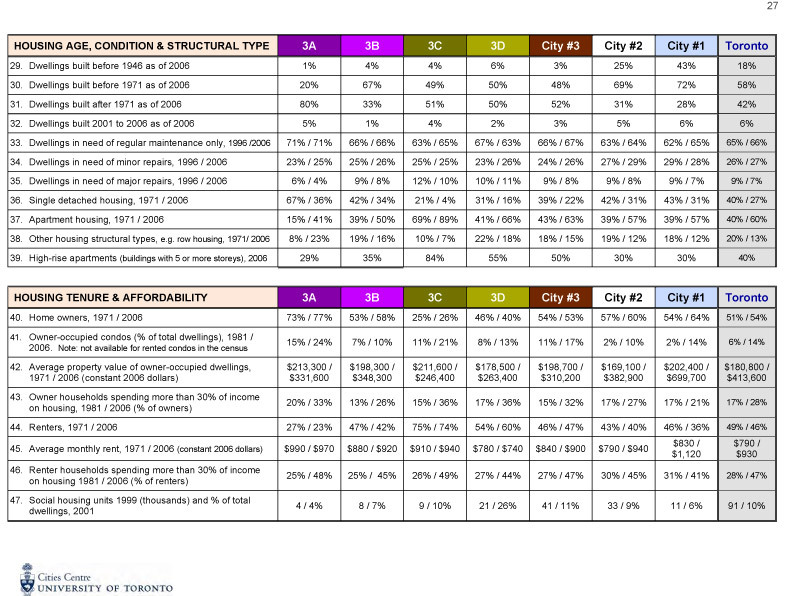 It outlines the final set of domains and indicators chosen for analyzing Toronto’s neighbourhoods. It looks at neighbourhood vitality in Toronto by deploying the tool in 140 Toronto neighbourhoods. The central conclusion of this study is that Toronto is behind comparable cities in terms of developing a neighbourhood indicator system. While there have been some positive and indeed central developments (such as the definition of 140 neighbourhoods thereby establishing the geography for analysis and response), Toronto lags in this area. 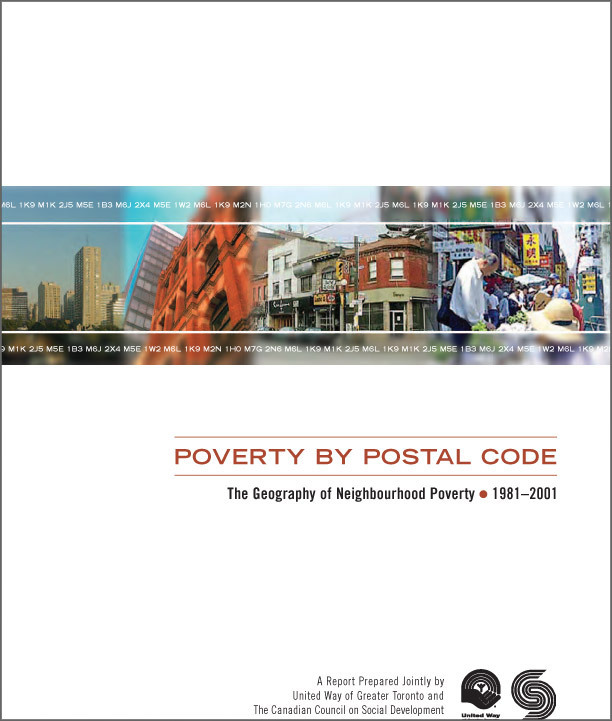 Poverty by Postal Code is a study of the spatial concentration of family poverty in the City of Toronto over two decades. The findings are deeply disturbing. 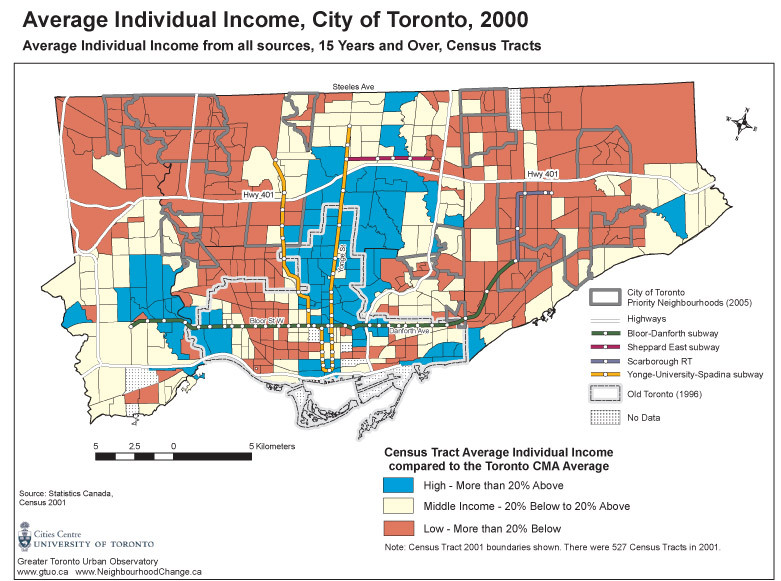 In the twenty years prior to 2001, most ‘poor’ families in Toronto lived in mixed-income neighbourhoods. 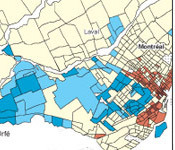 Today, they are far more concentrated in neighbourhoods with high levels of poverty. 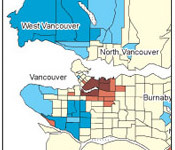 The increase in the number of higher poverty neighbourhoods in has been rapid. The growing spatial concentration of poverty has impacted certain vulnerable groups much more acutely than others. 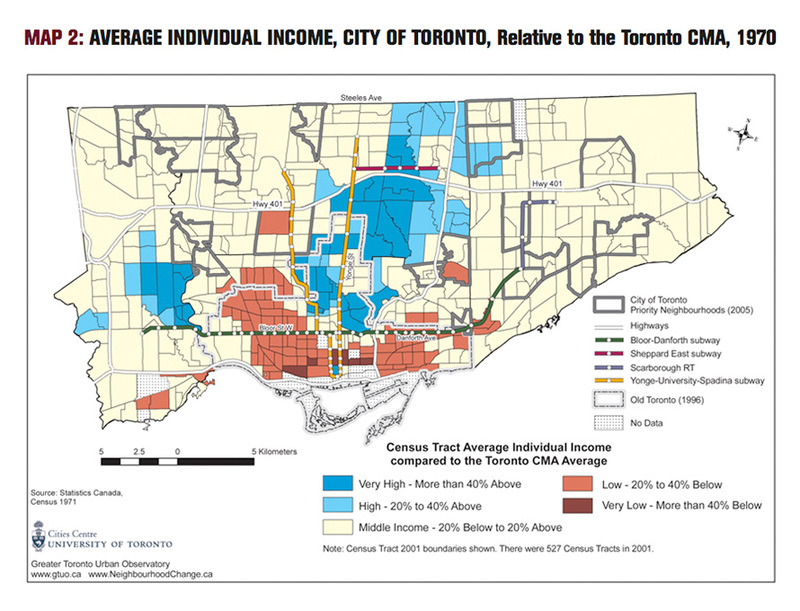 Falling median incomes, widening income gaps between rich and poor, and rising poverty levels are having a profound effect on the spatial distribution of poverty in Toronto. The revival of interest in neighbourhoods is part of a re-assertion that ‘place matters’, to the well-being of individuals and to the health and prosperity of the broader community. The major reasons: concern about growing neighbourhood concentrations of poverty and disadvantage and their effects on individuals and the broader community; increasing recognition that cities and urban regions are socially, environmentally, and economically critical to the well-being of individuals, regions and countries; and the ‘discovery’ of social capital and its potential as a building block for social cohesion and to finding local solutions to problems. 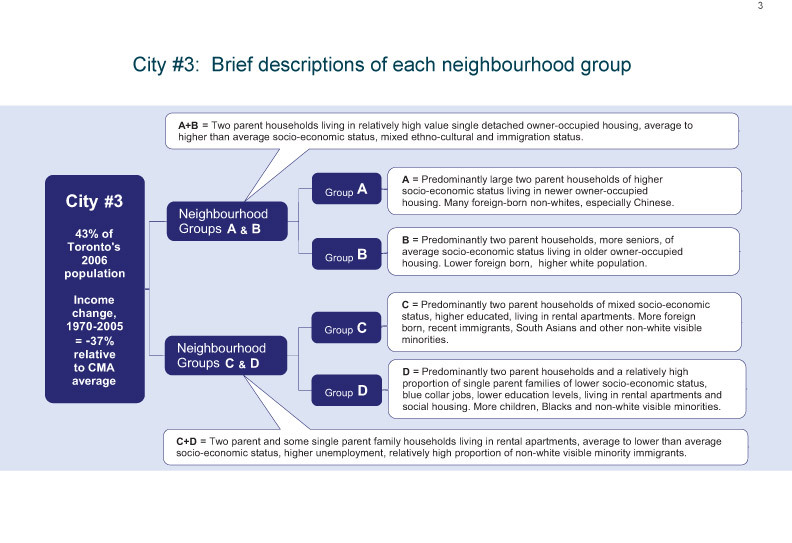 There are three inter-connected defining characteristics of a “strong neighbourhood”: those related to social relationships (e.g. community involvement, mutual responsibility); those related to ‘place’ (e.g. active street life); and those related to both (e.g. safety). 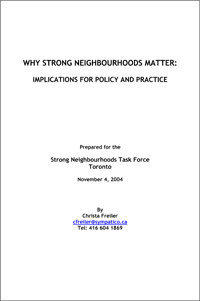 This paper defines strong neighbourhoods as inclusive, vibrant, cohesive, and safe. This issue of Ideas that Matter provides our readers with a glimpse of a remarkable community in transition. Last year Ideas that Matter was engaged by the Toronto Community Housing Corporation (one of North America’s largest public housing landlords) to convene a broad-based city-wide forum on the ‘revitalization’ process of one of their largest holdings, the community of Regent Park. 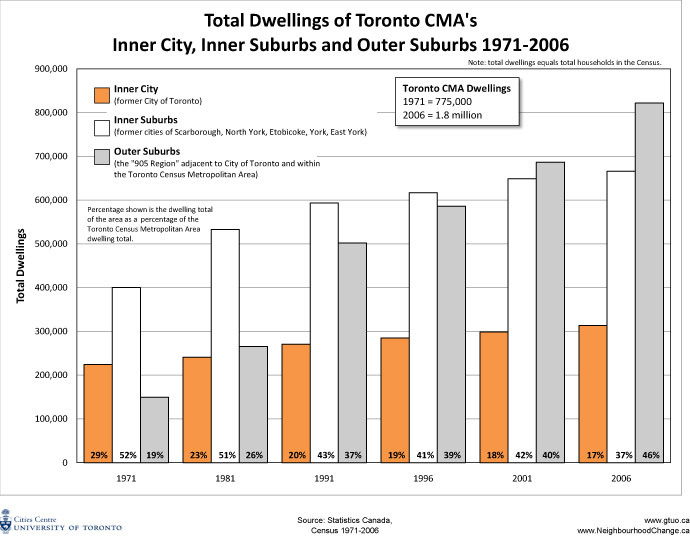 The era of suburban and metropolitan innocence in Toronto is over. 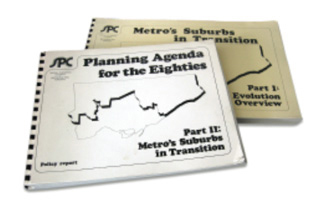 The social development patterns reviewed in this report suggest that important social transformations have taken place in the post-war suburbs of Metro. This background report consists of review and analysis, providing a more comprehensive framework for understanding important trends and patterns in the social development of Metro’s newer suburbs. It introduces a set of issues and concerns. The newer suburbs now contain 50% of all inner city students in Metro’s schools, most of Metro’s families with both parents in the labour force, high numbers of single parent families, significant groups of unemployed and alienated youth, and a multitude of cultures and races. This report contains policy, planning, and service recommendations arising from the 1979 Part 1 background report and from subsequent feedback and consultations. 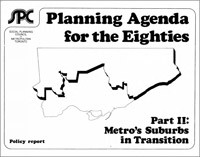 The Social Planning Council is calling for dramatic shifts in public priorities and planning to re-build Metro’s suburbs for what they were originally intended to be, a place for family living. The absence of urgently needed help for the diverse needs of suburban families is a deep source of concern. Severe spending cutbacks by the Ontario government have delayed the introduction of needed programs for the changing population. The report calls for government to assume once more a leadership role to address economic and social needs, and thereby reverse the passivity and drift of the seventies. What is called for are climates for renewed growth in Metro, responsible public spending policies, new planning capabilities, recognition of adaptation priorities, sensitivity to special needs, and a representative municipal electoral structure.